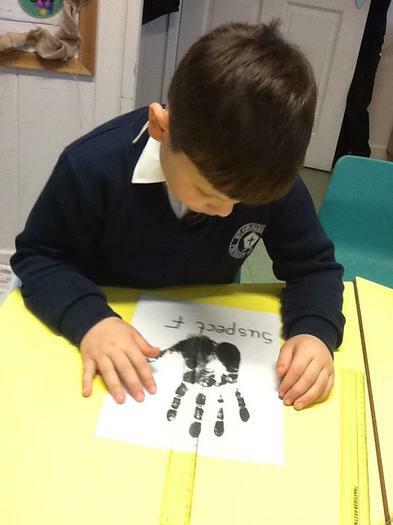 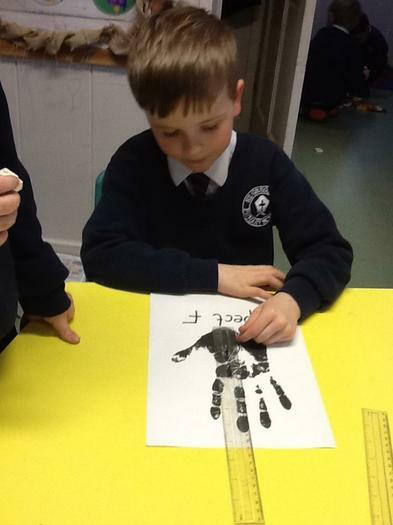 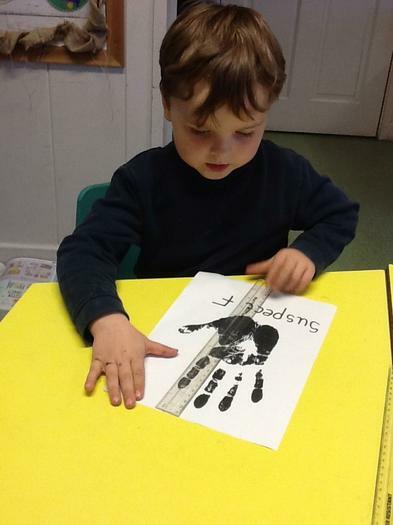 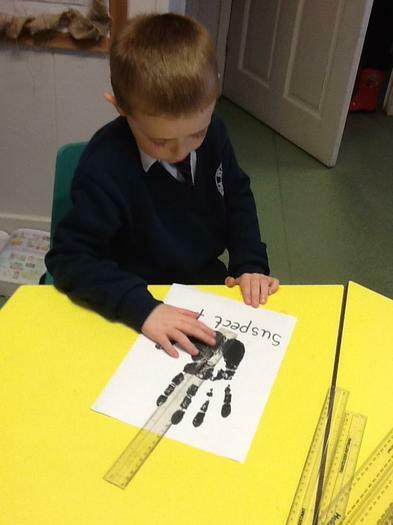 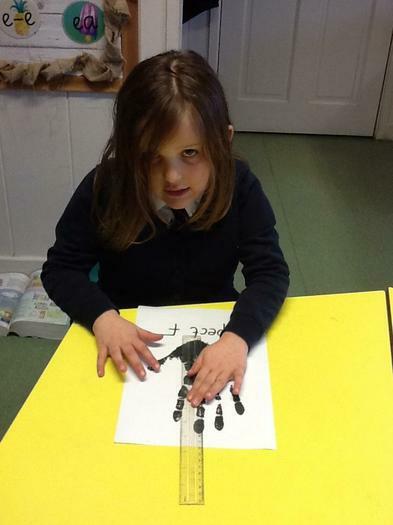 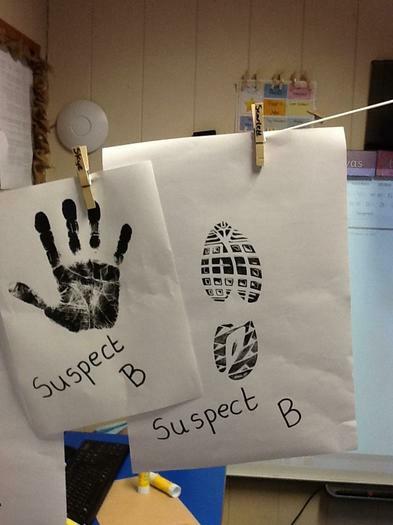 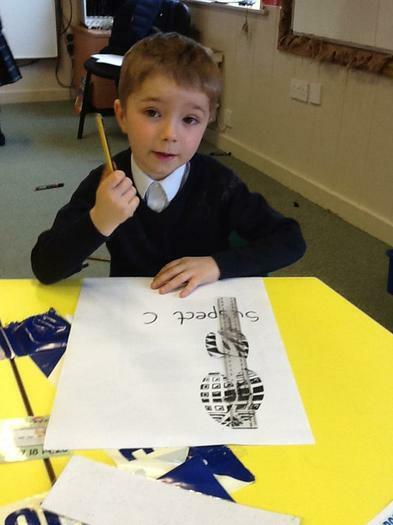 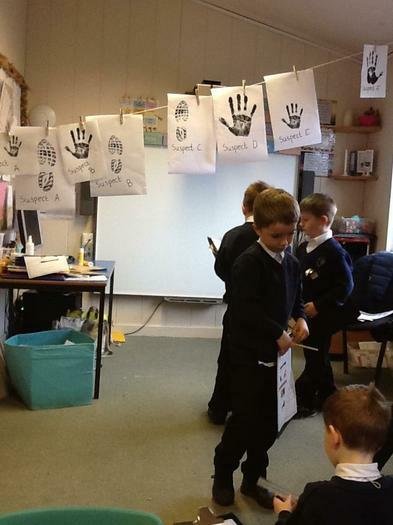 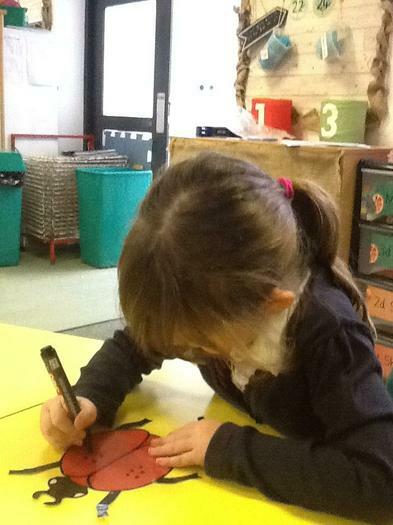 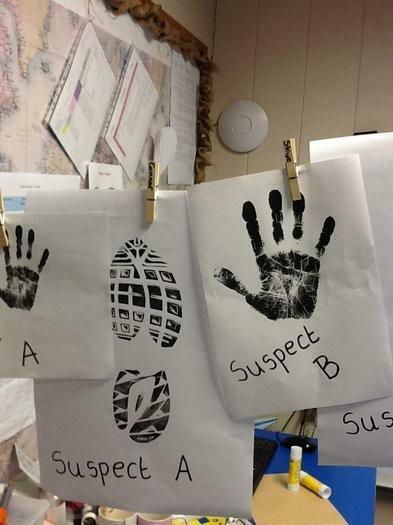 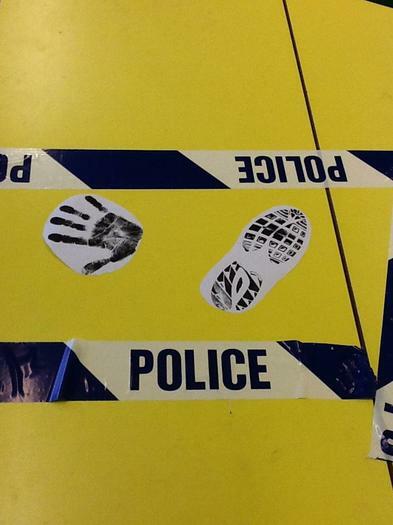 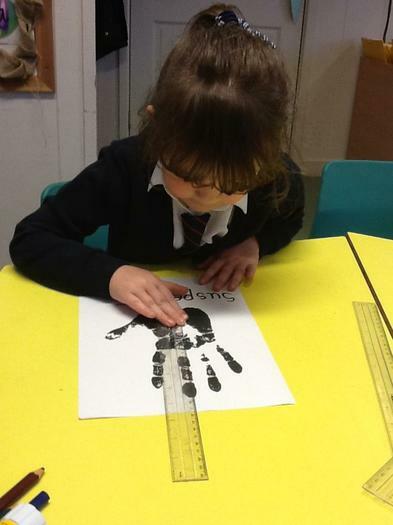 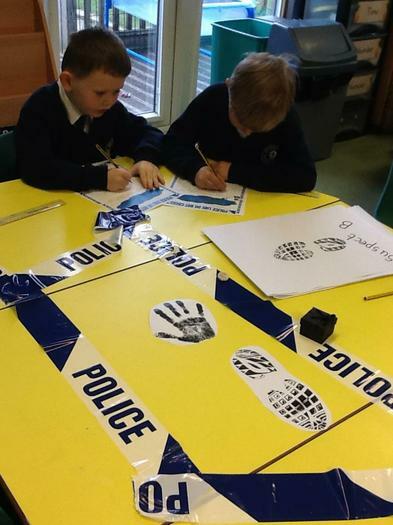 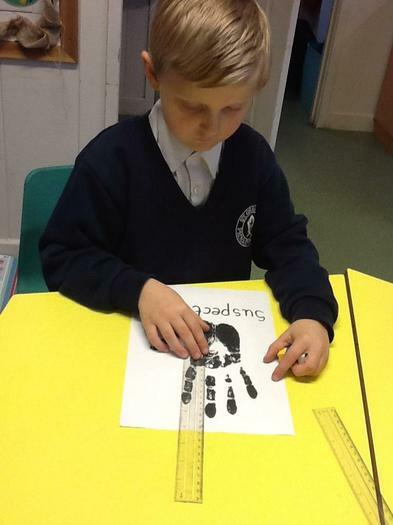 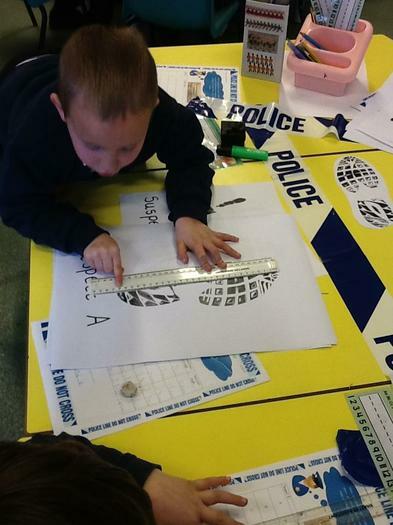 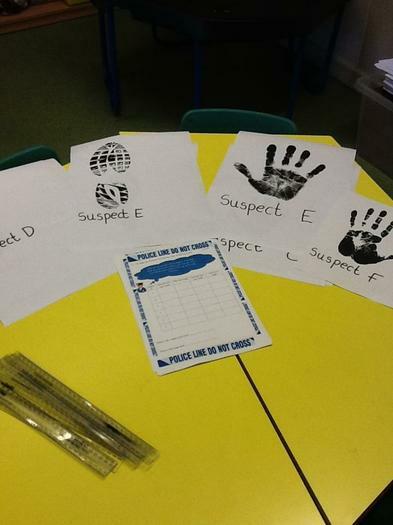 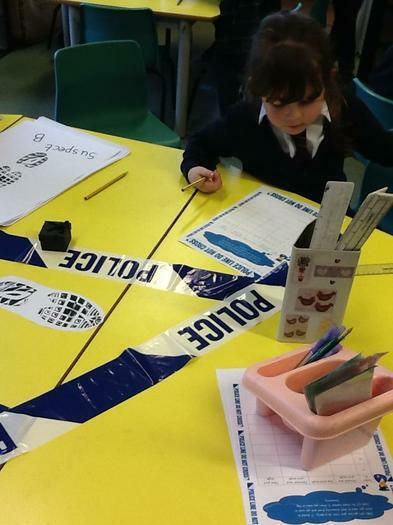 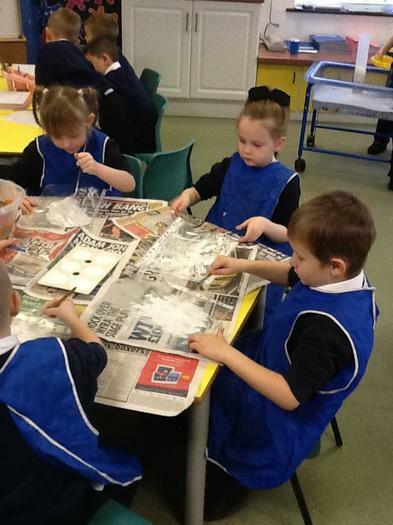 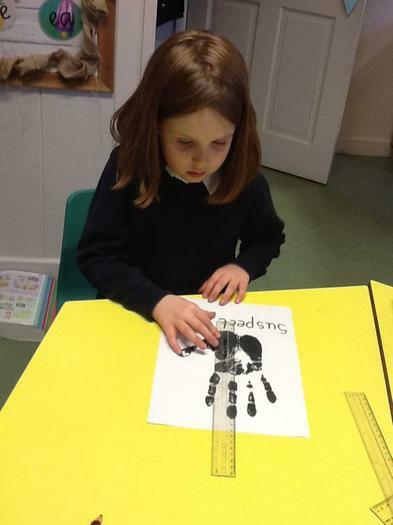 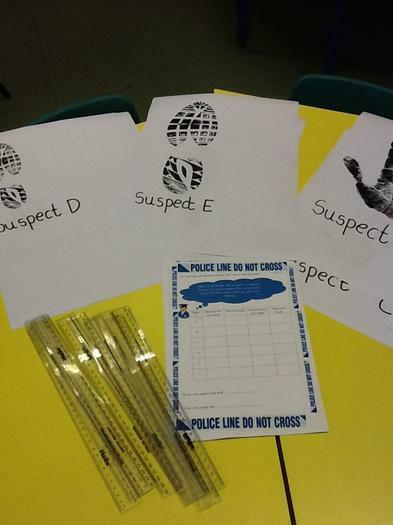 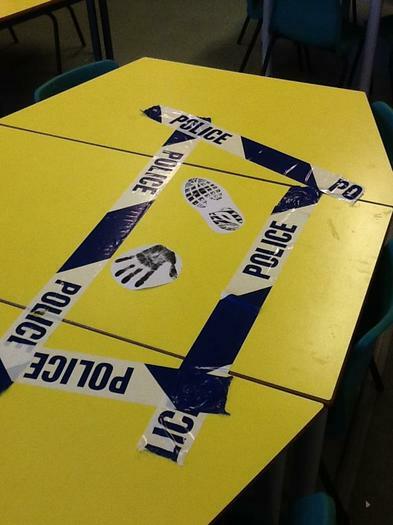 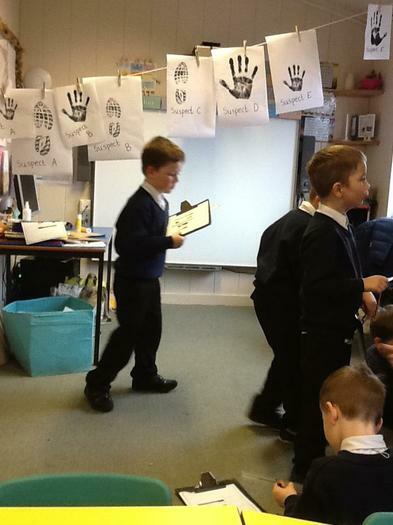 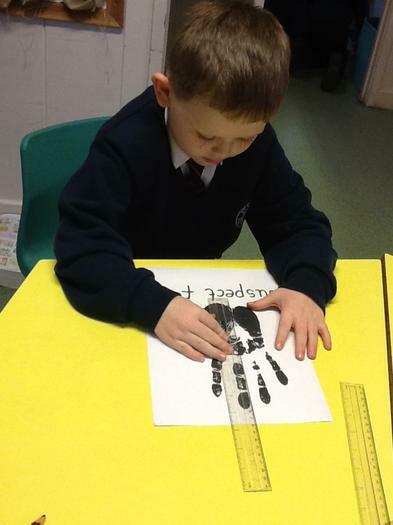 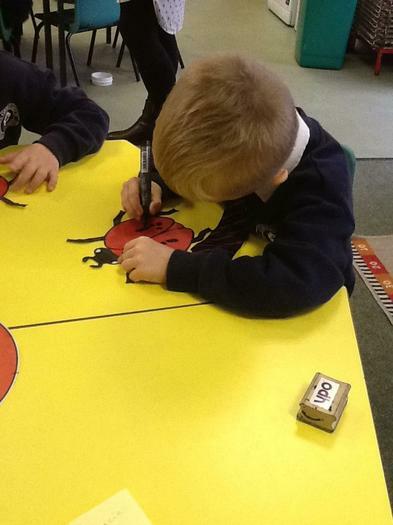 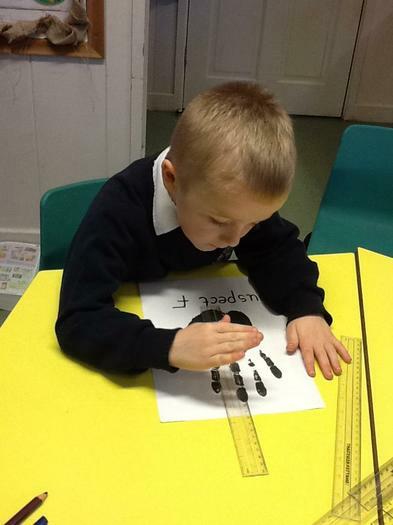 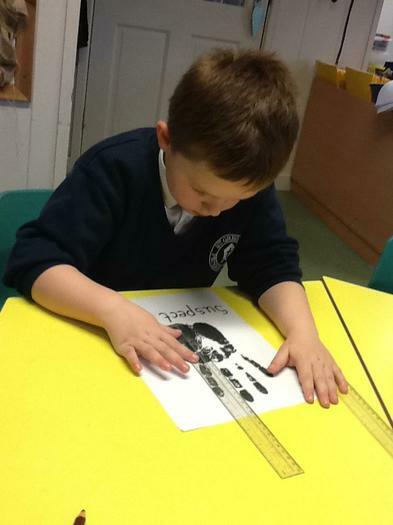 We were police officers today and investigated the size of the hand prints and foot prints left at our crime scene. 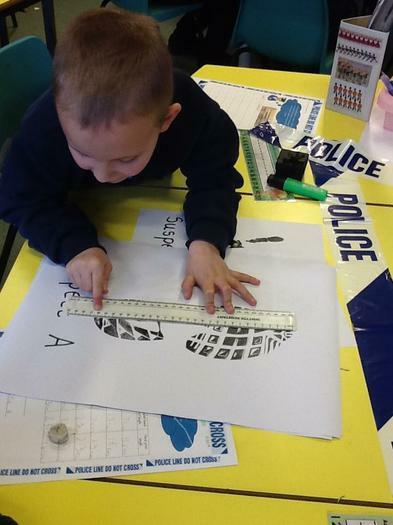 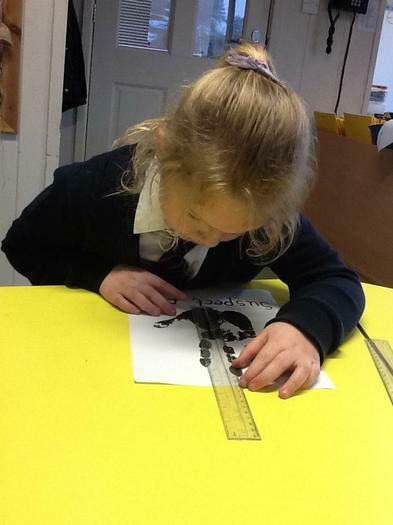 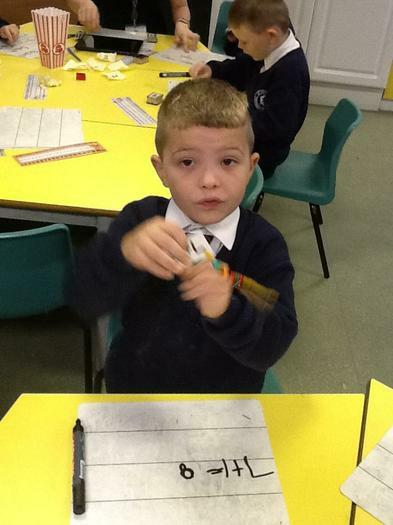 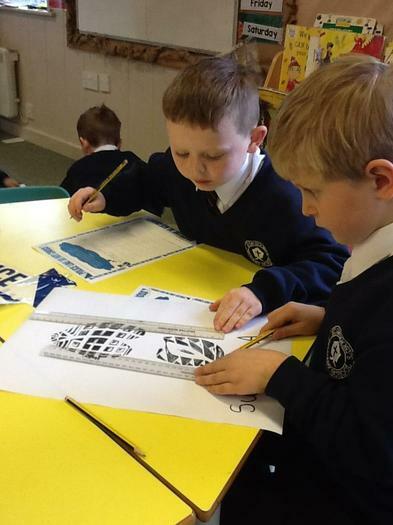 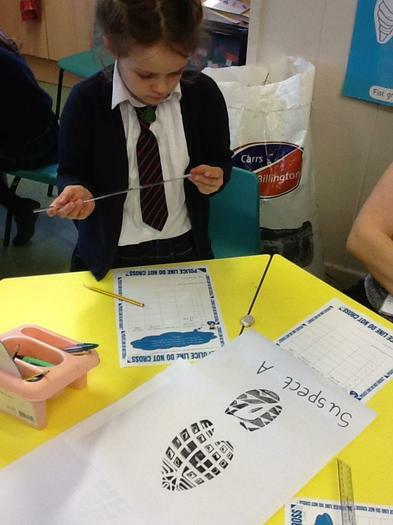 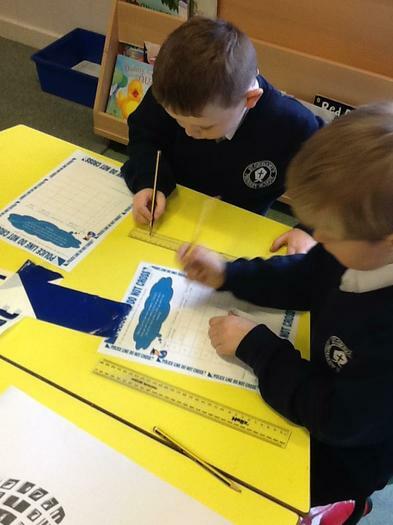 We used the ruler to measure in cm's. 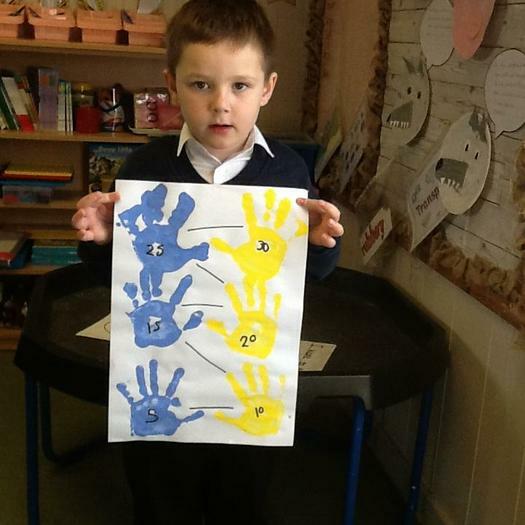 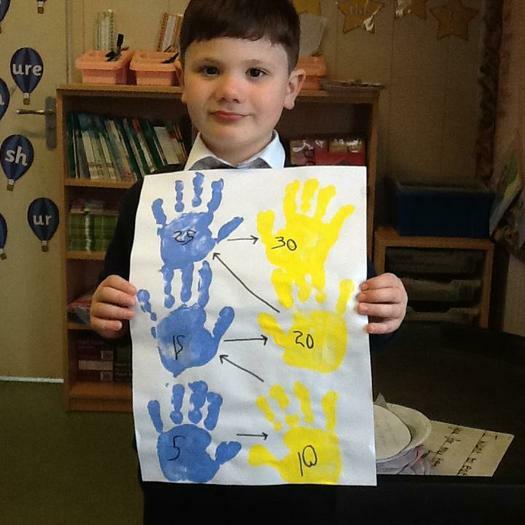 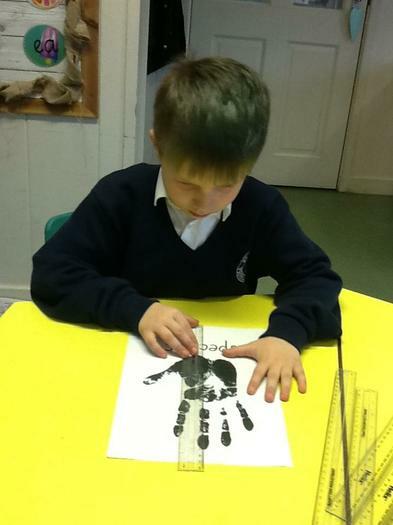 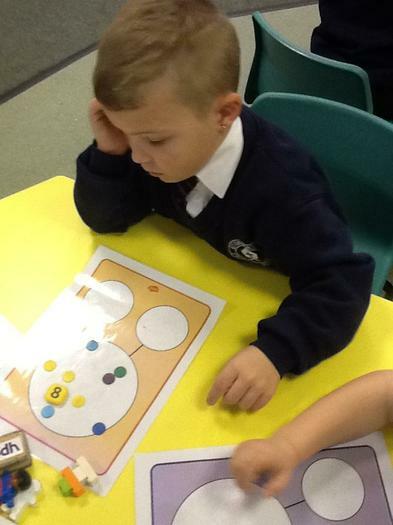 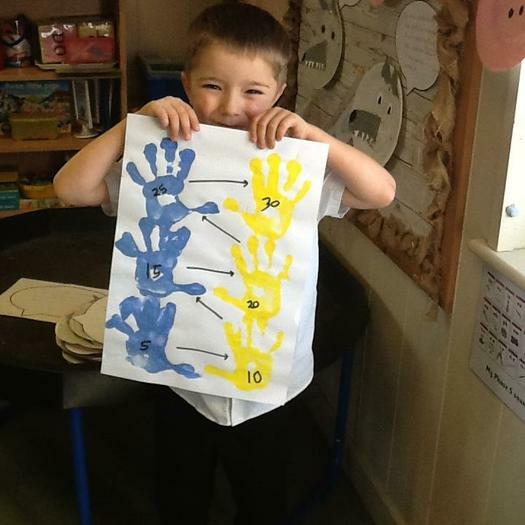 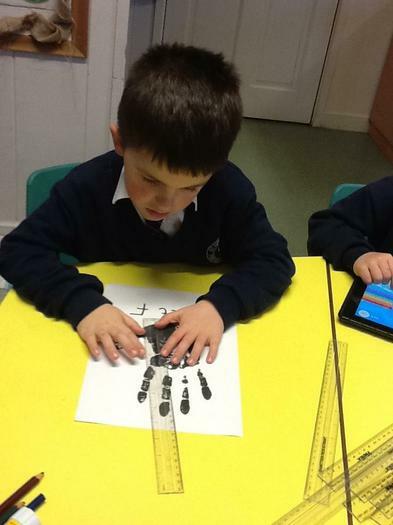 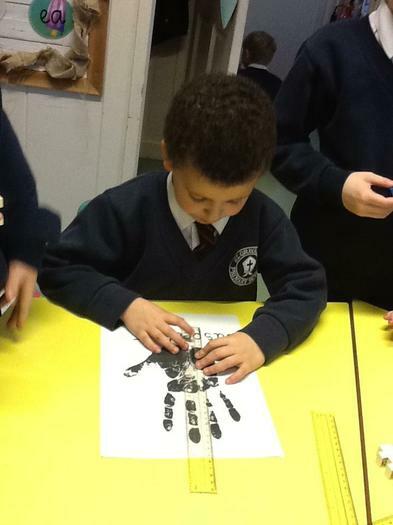 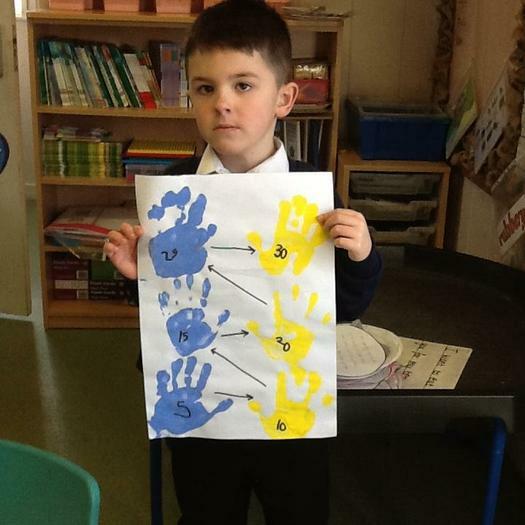 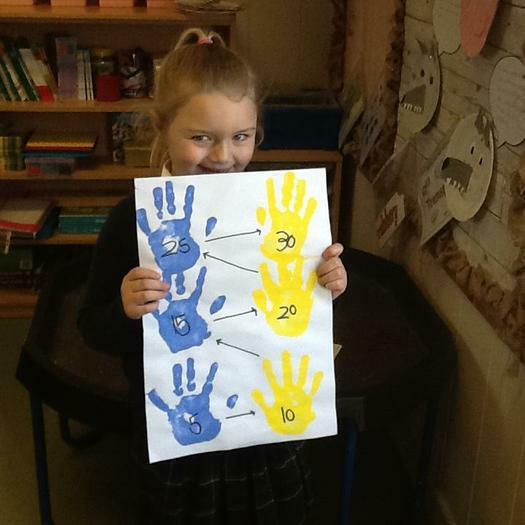 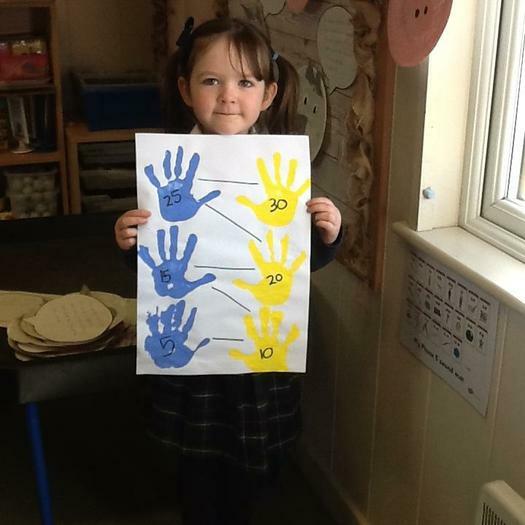 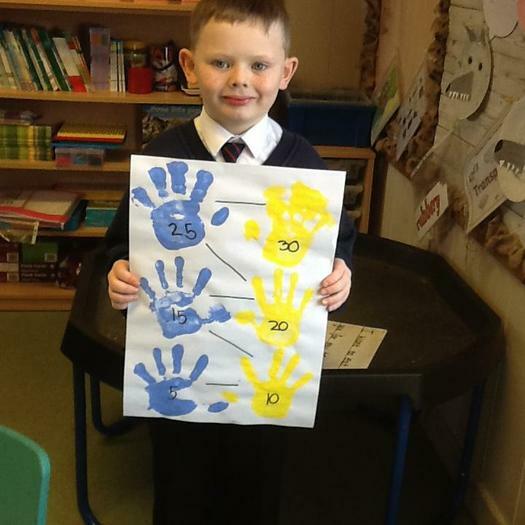 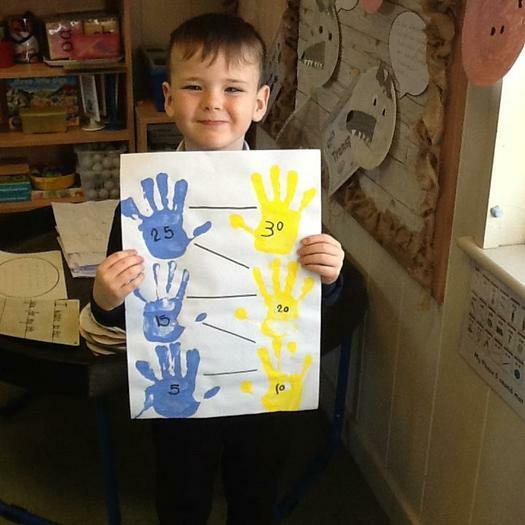 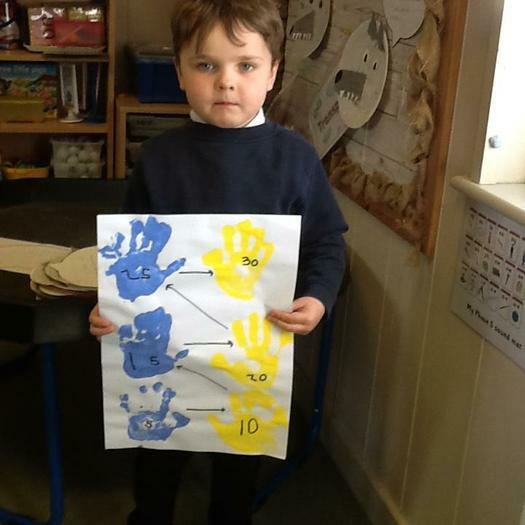 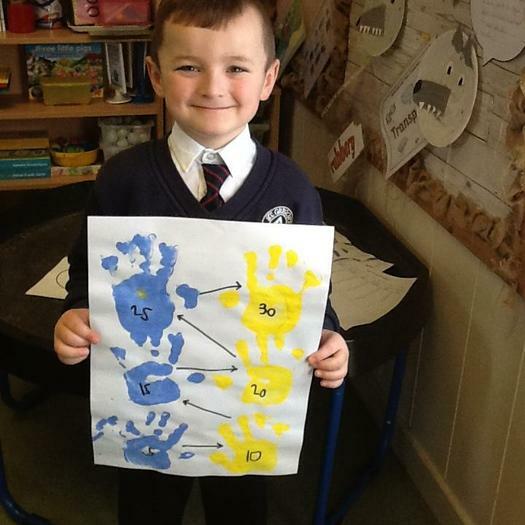 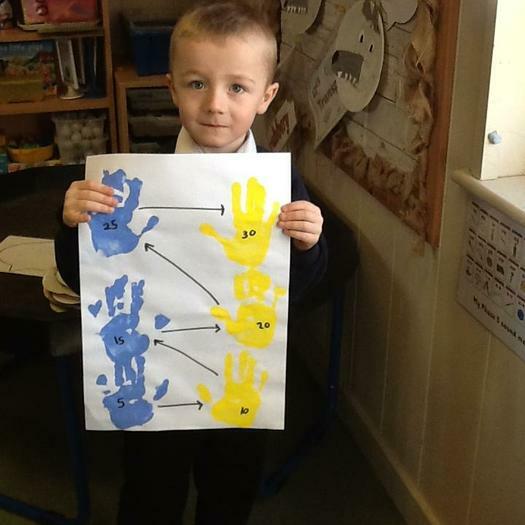 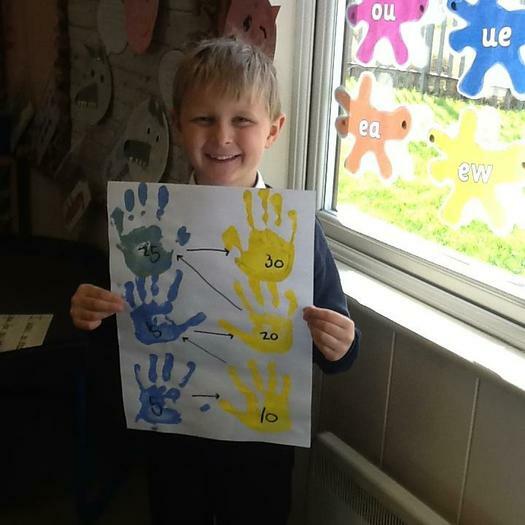 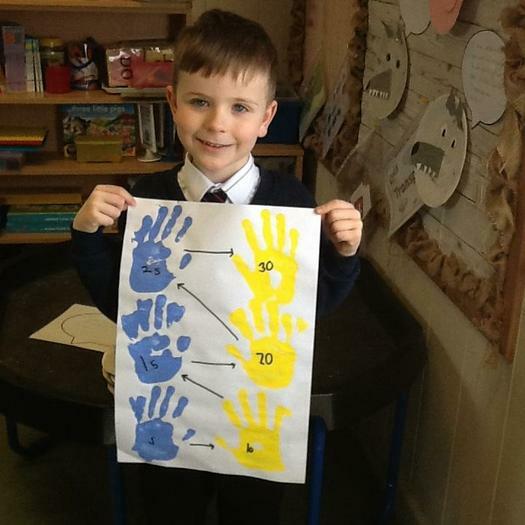 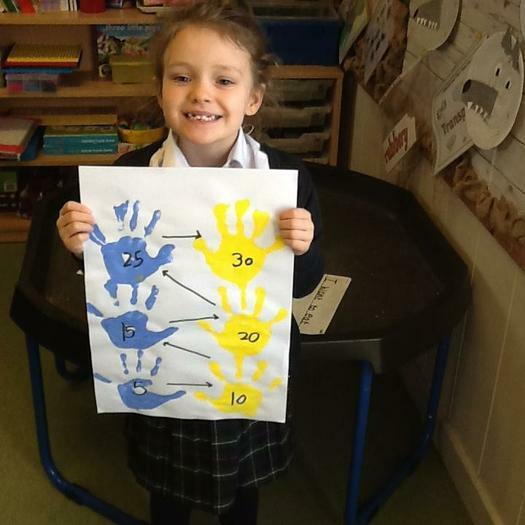 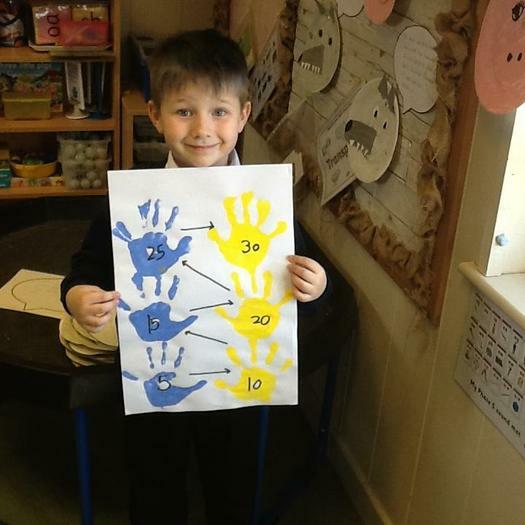 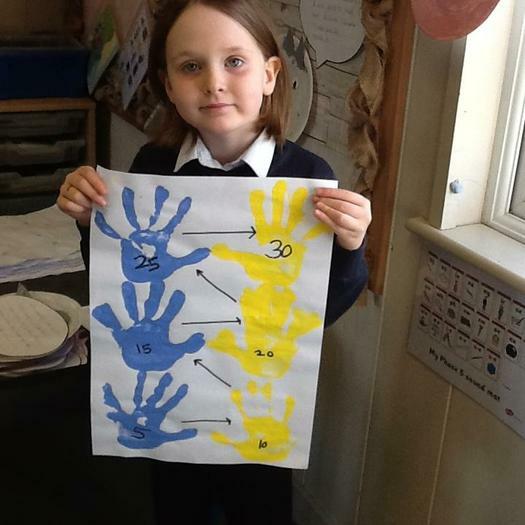 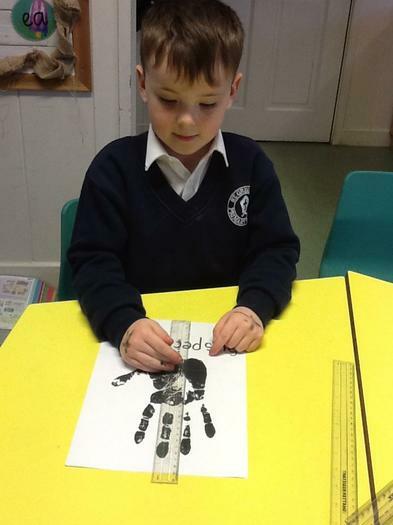 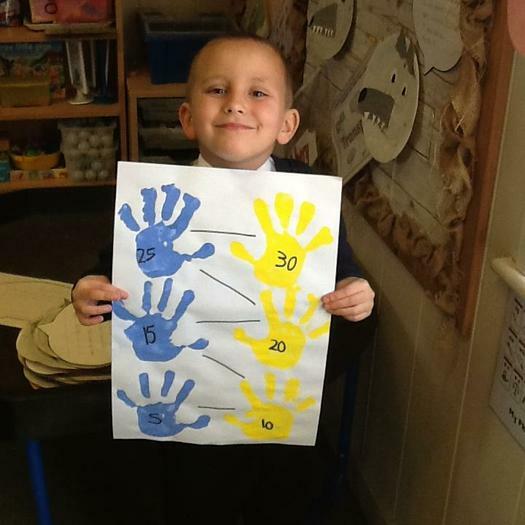 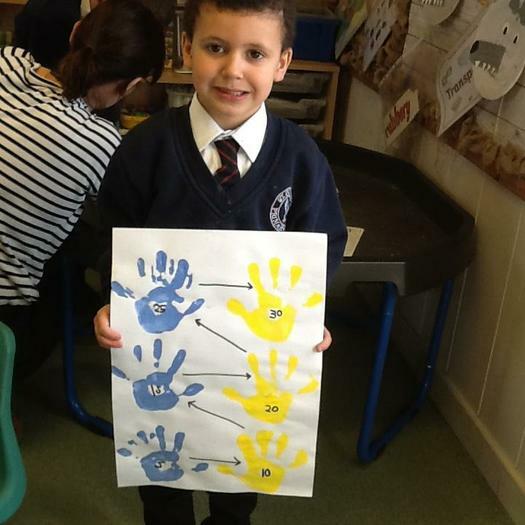 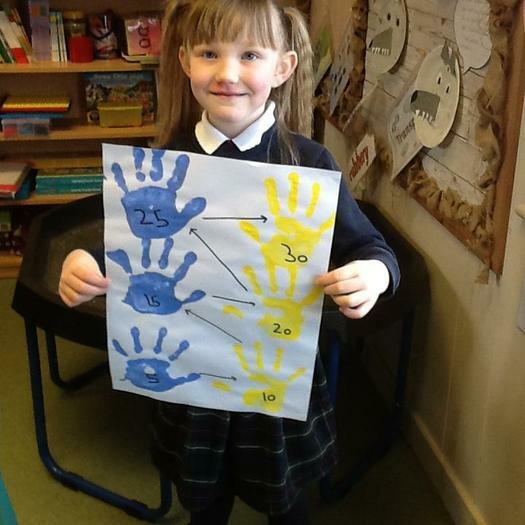 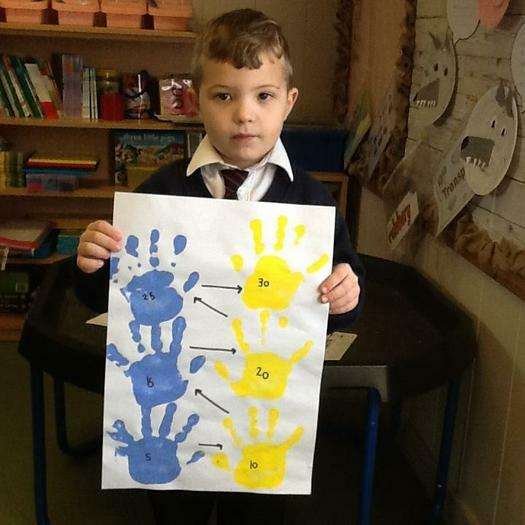 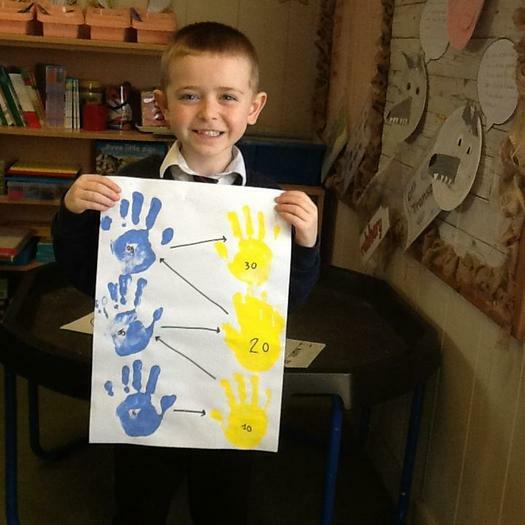 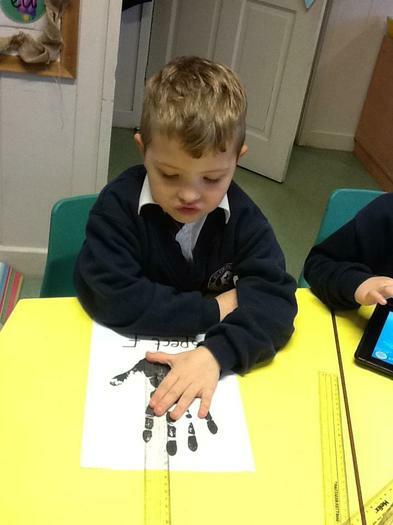 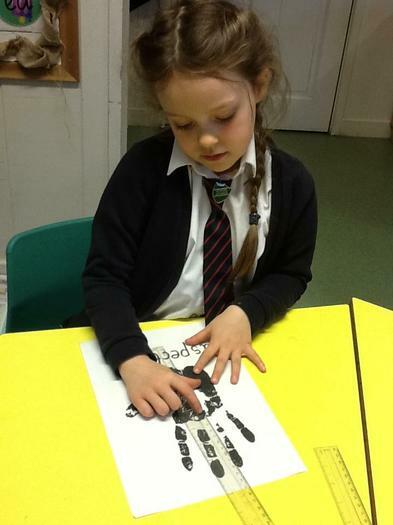 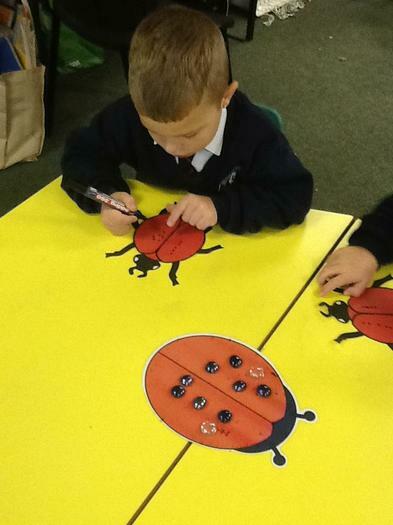 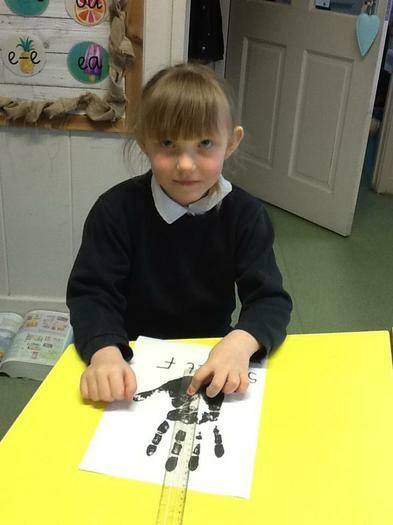 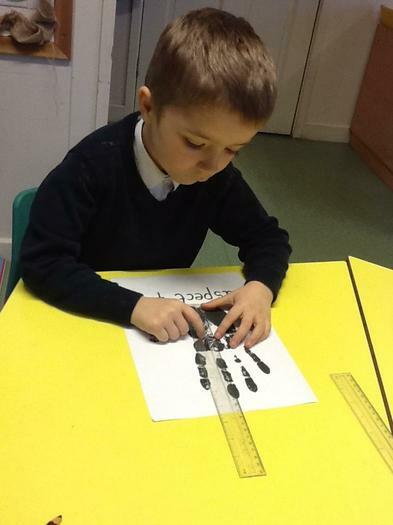 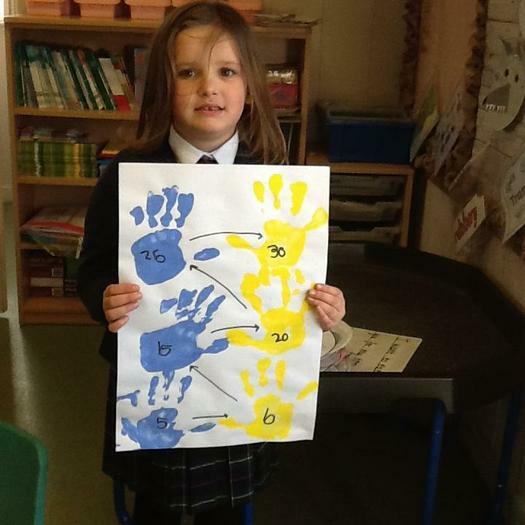 We have been learning to count in fives. 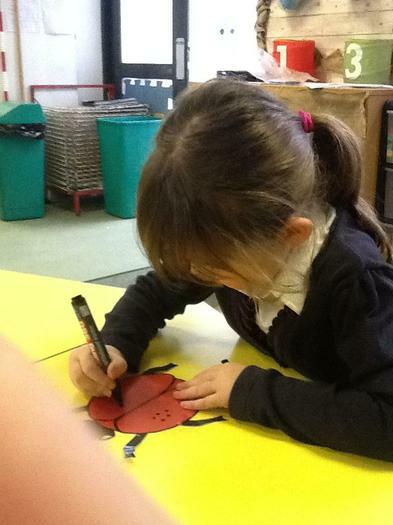 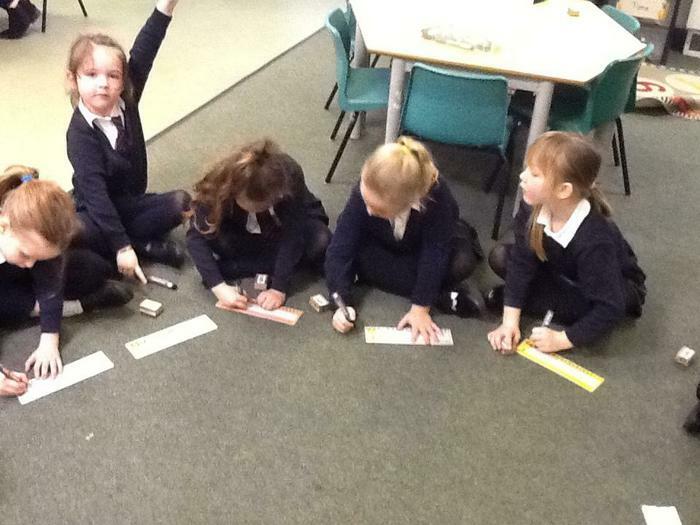 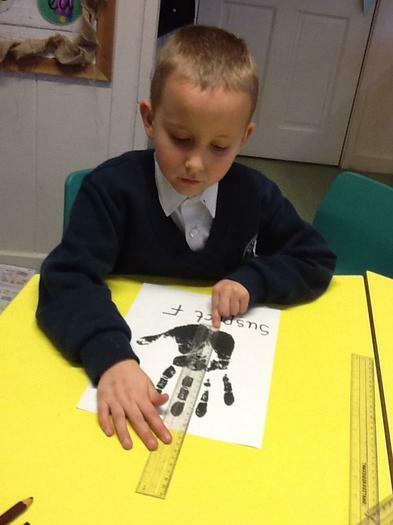 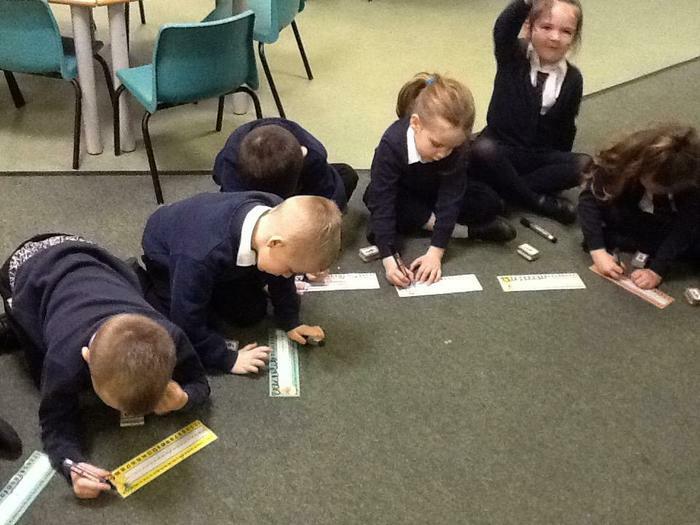 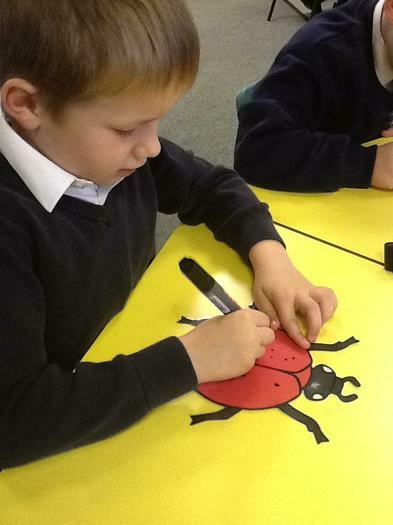 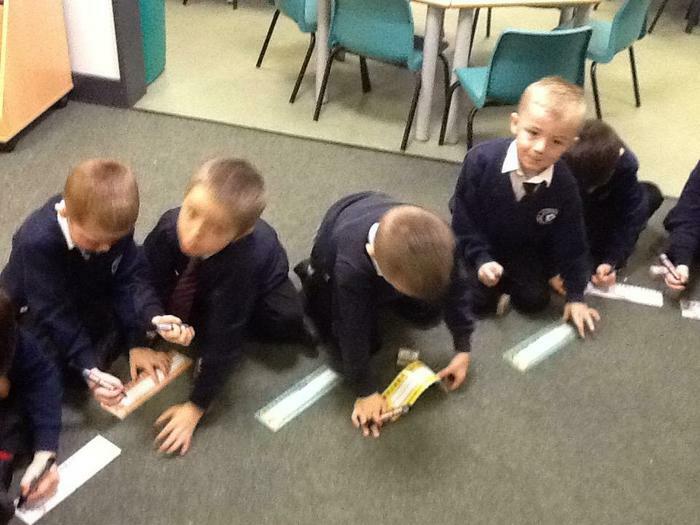 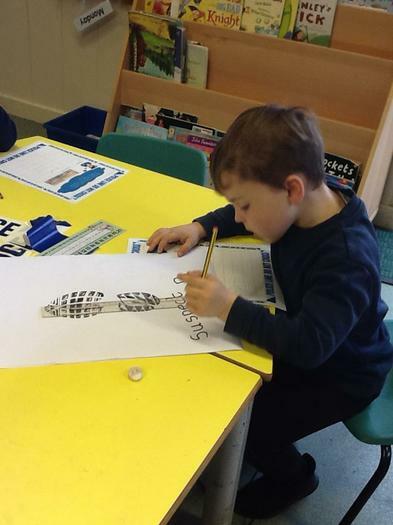 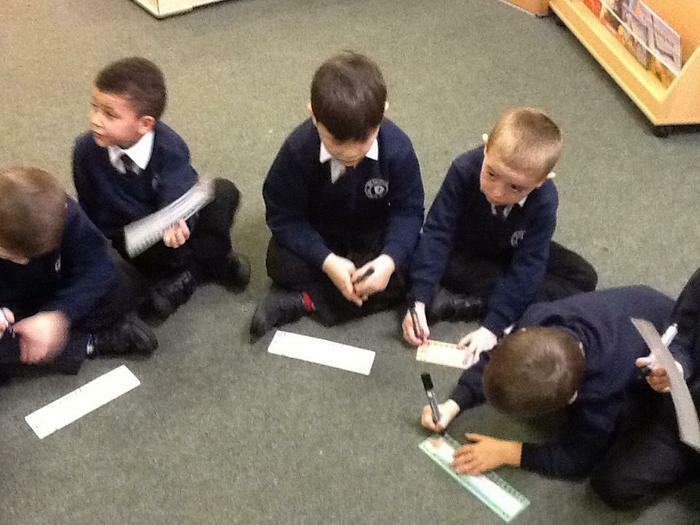 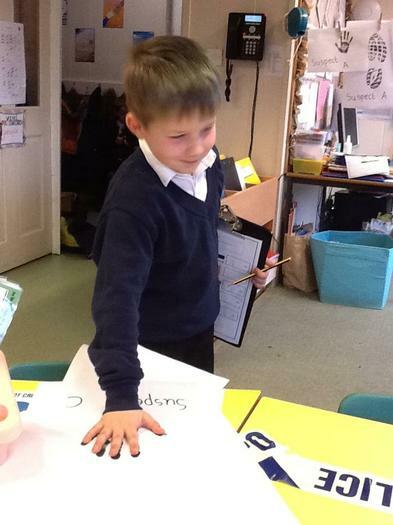 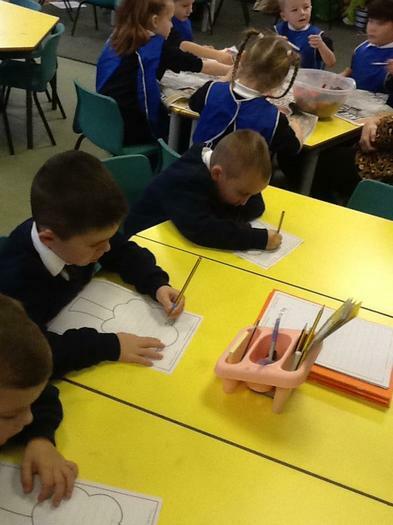 To extend our learning we wrote down how far in fives we could count. 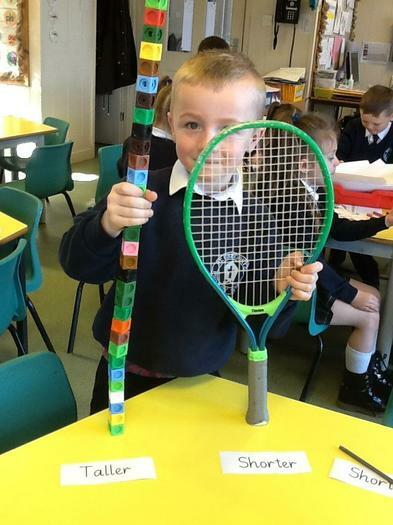 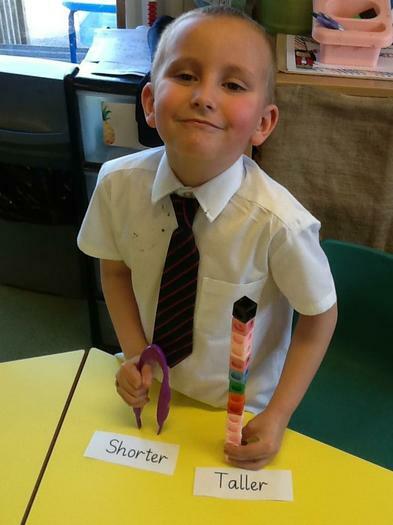 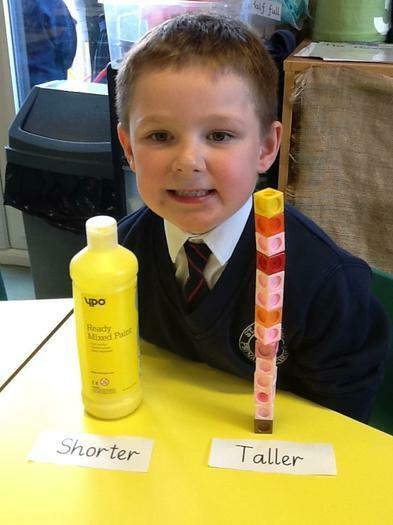 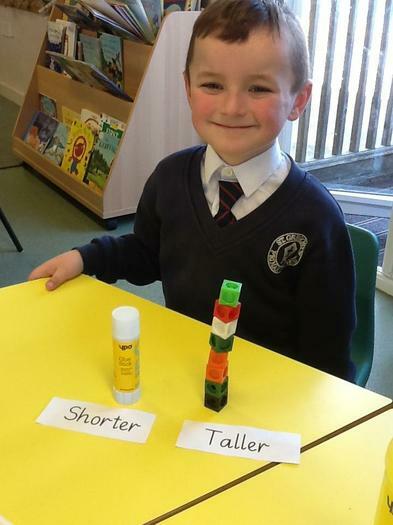 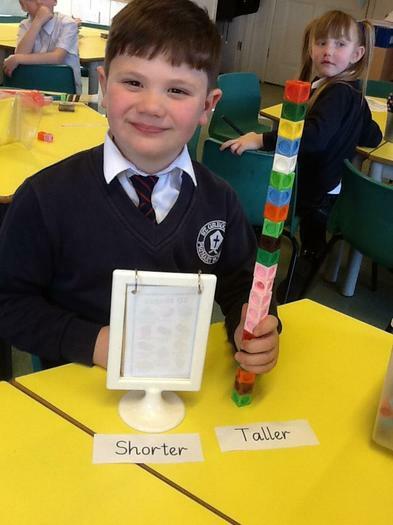 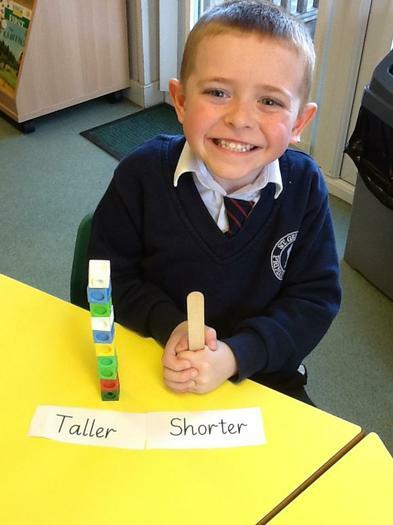 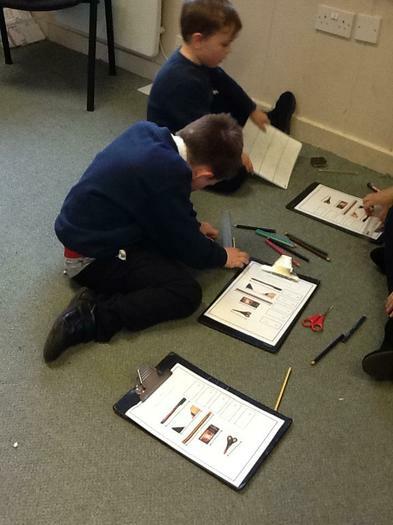 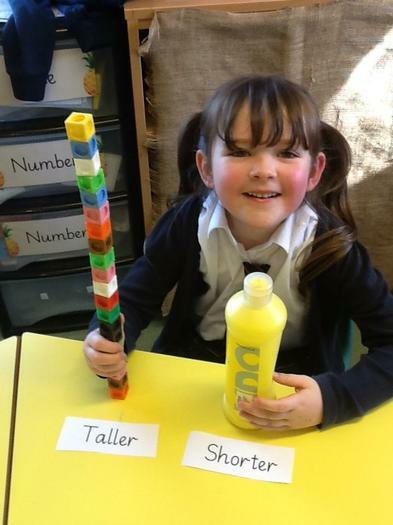 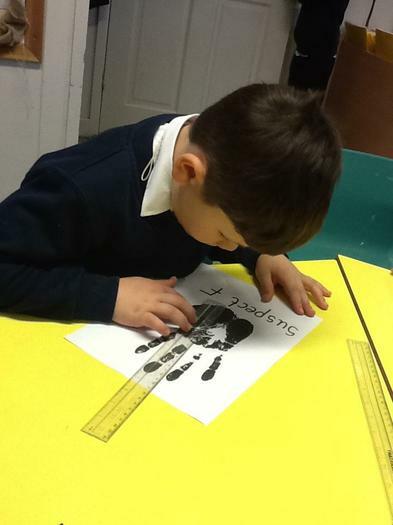 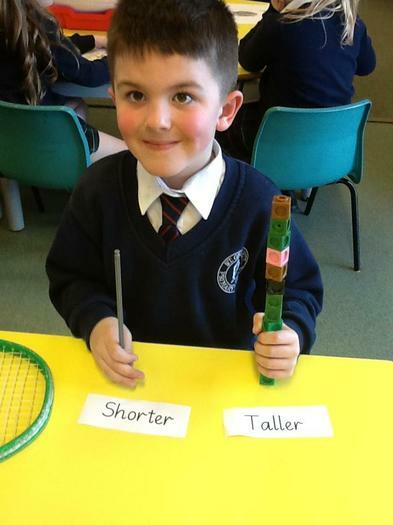 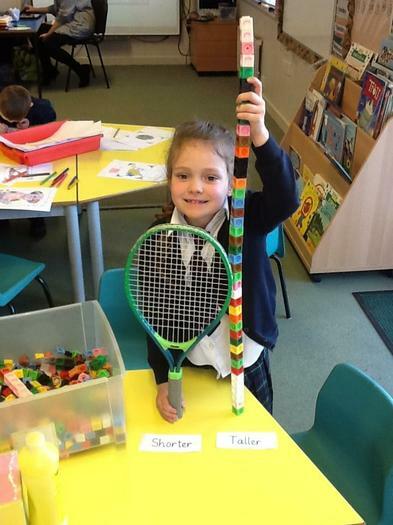 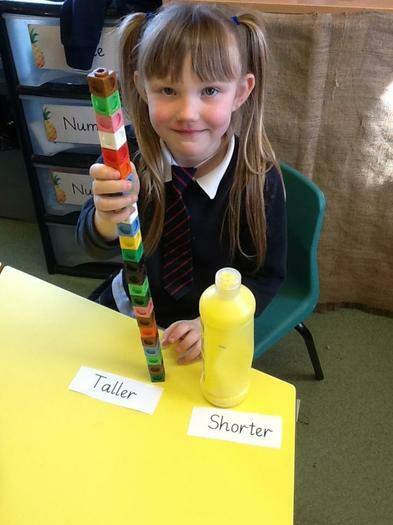 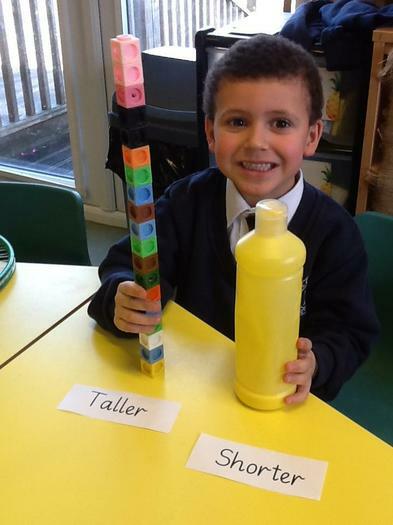 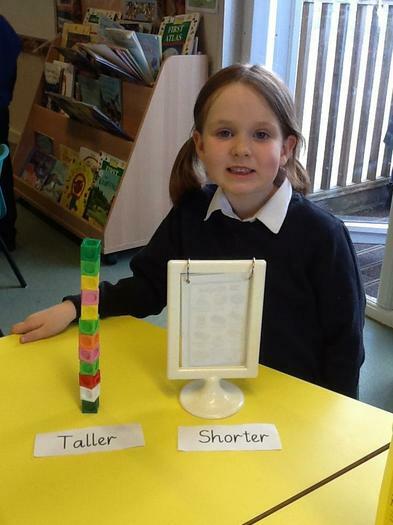 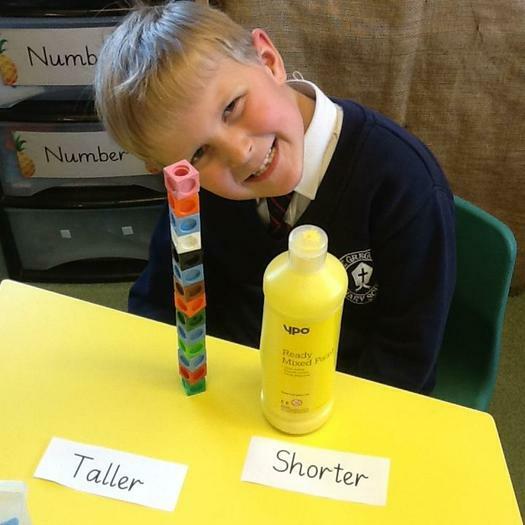 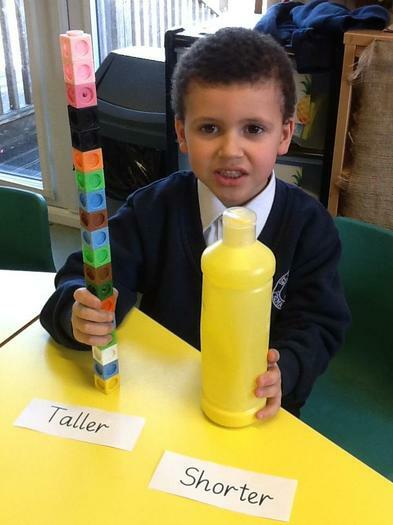 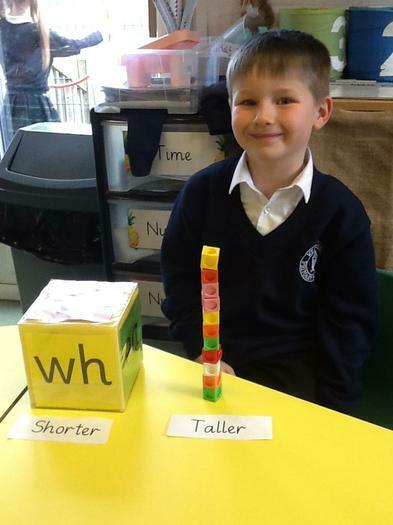 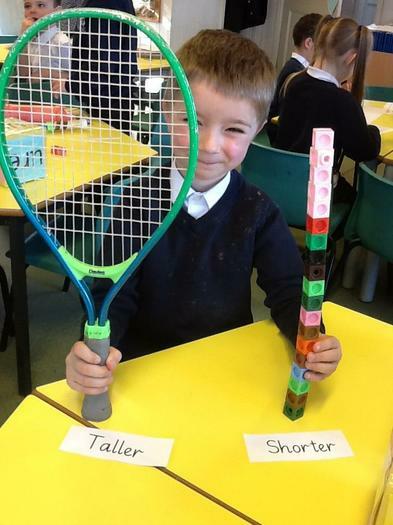 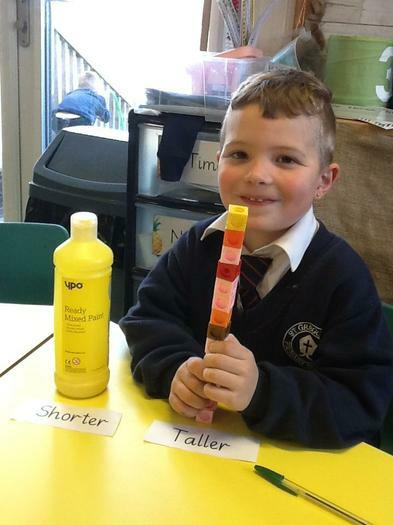 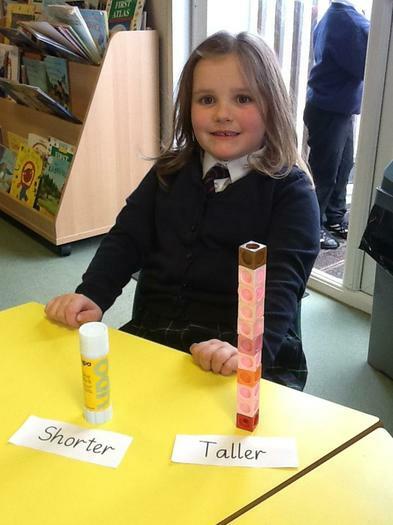 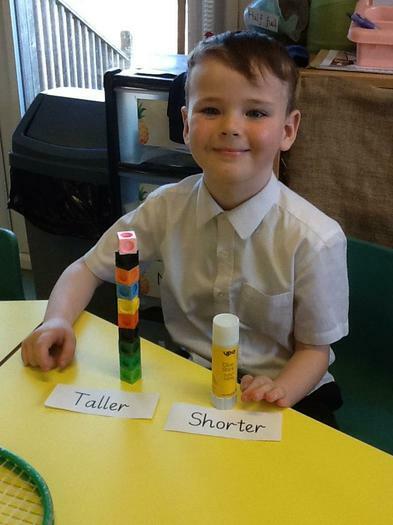 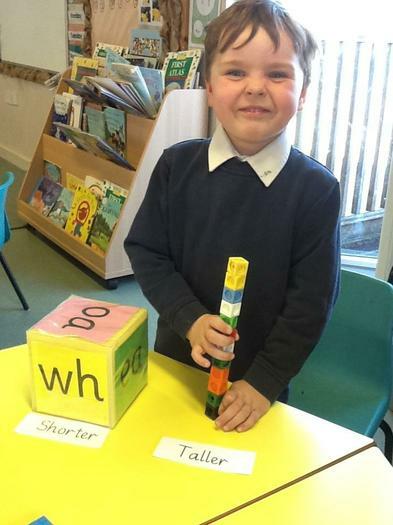 We have compared objects to see which were taller or shorter than each other. 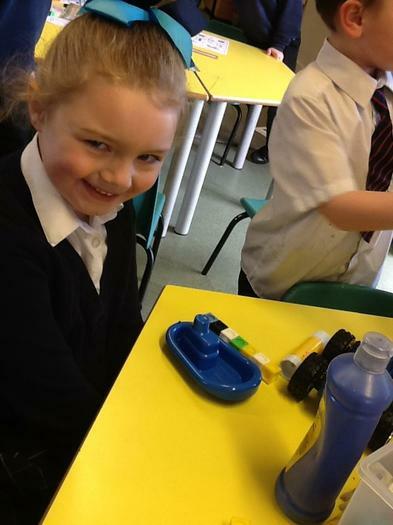 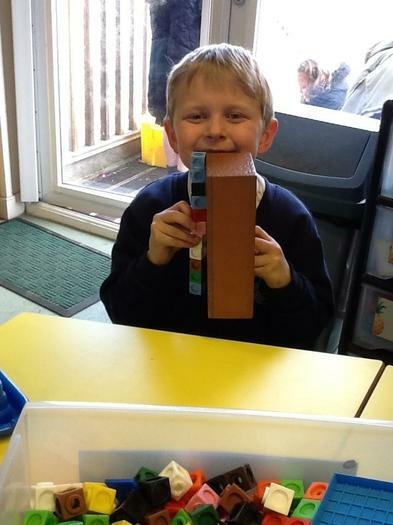 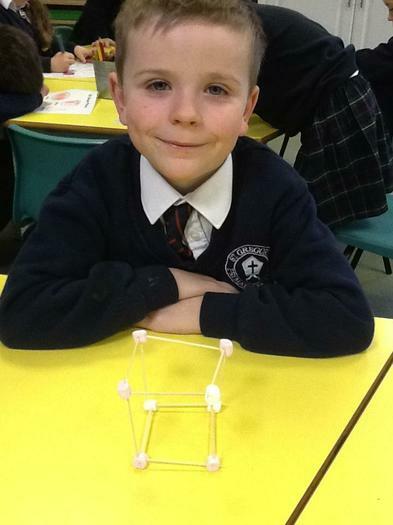 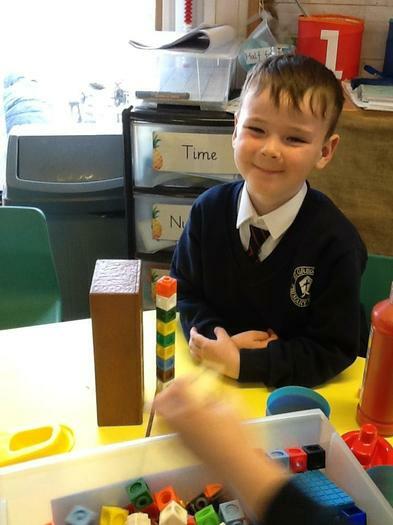 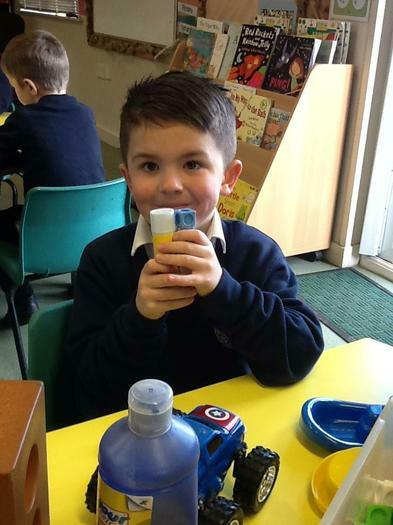 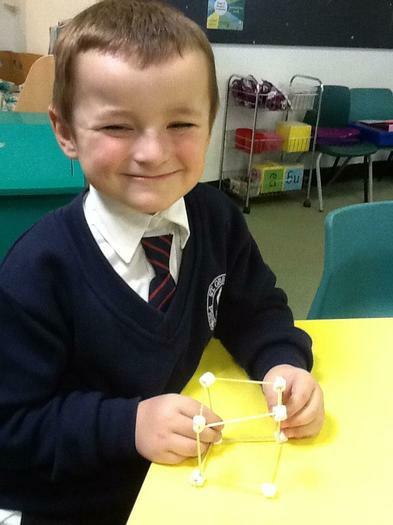 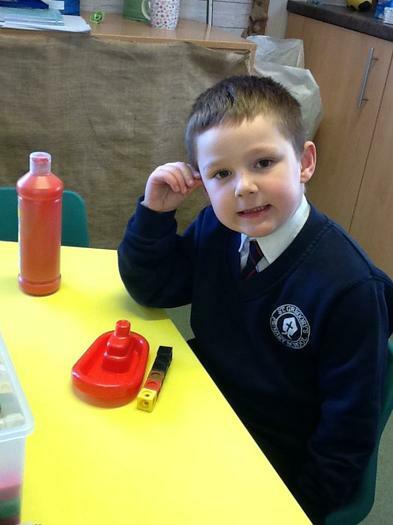 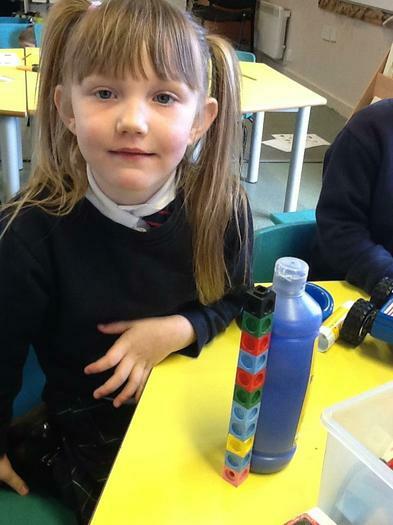 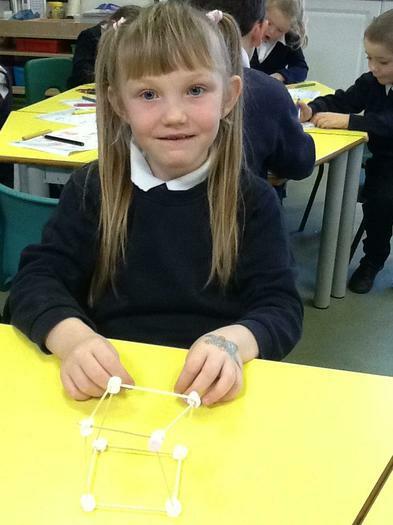 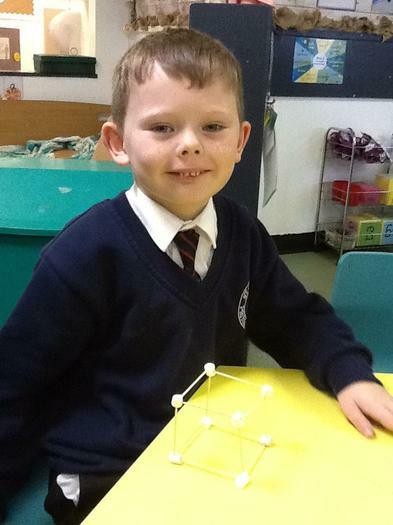 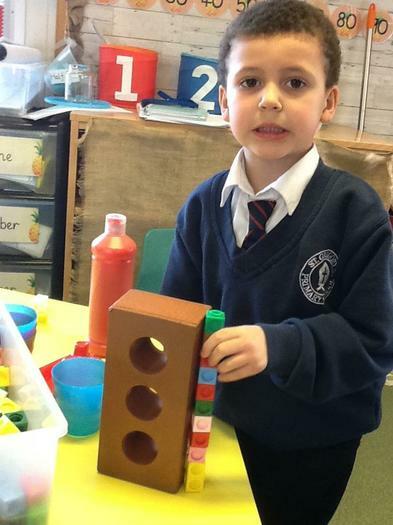 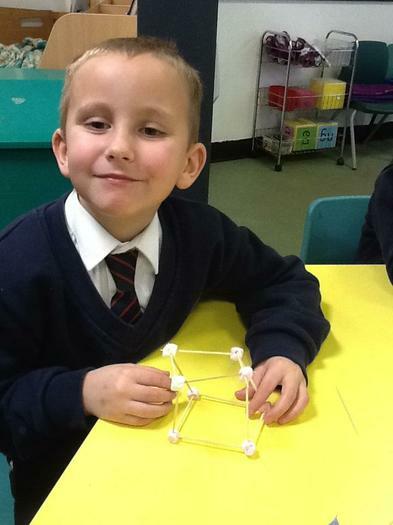 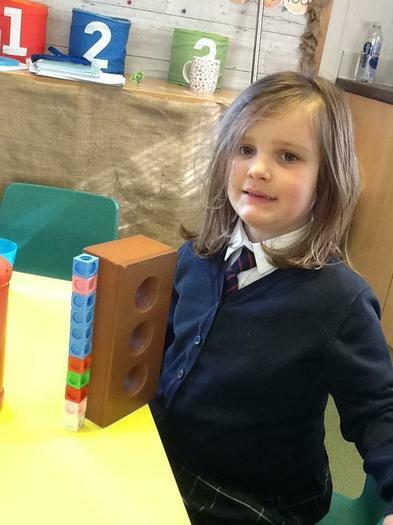 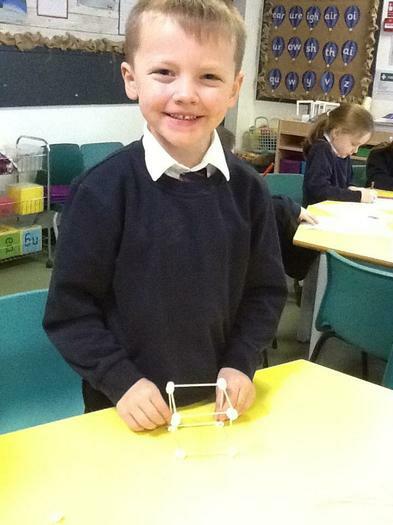 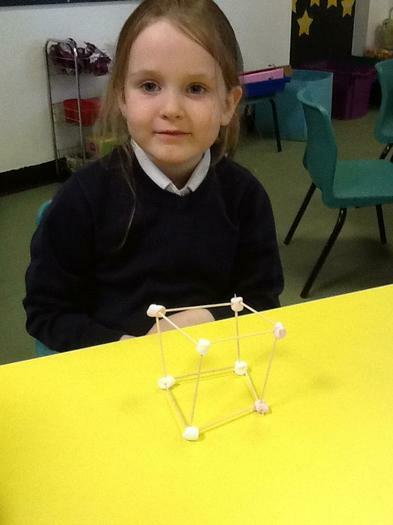 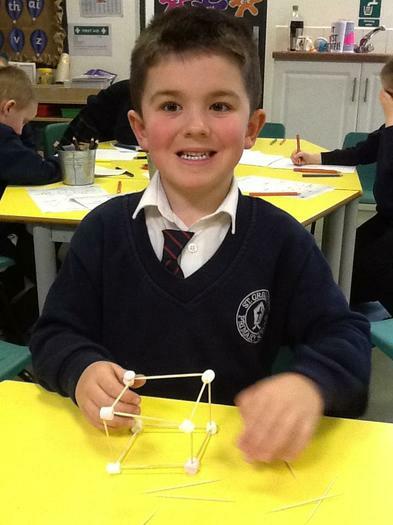 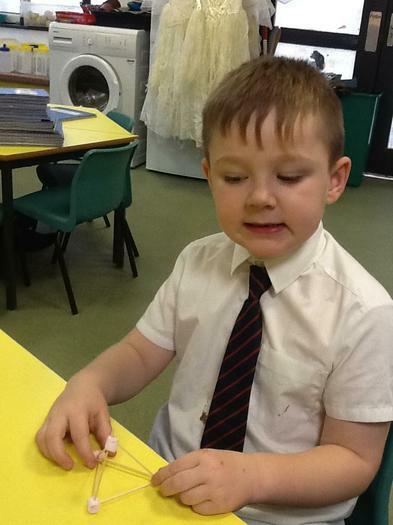 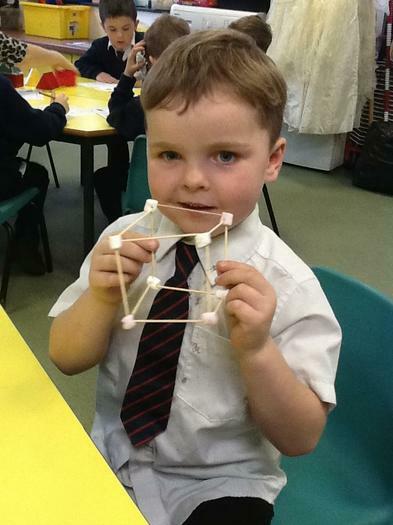 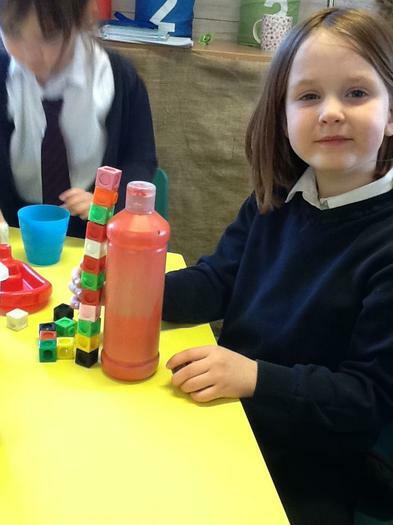 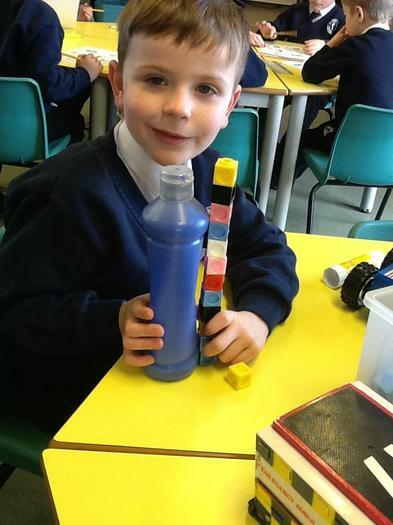 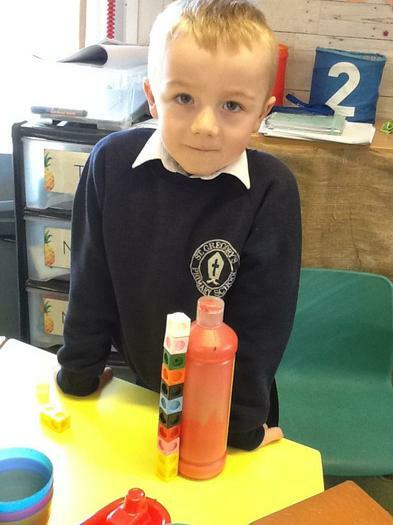 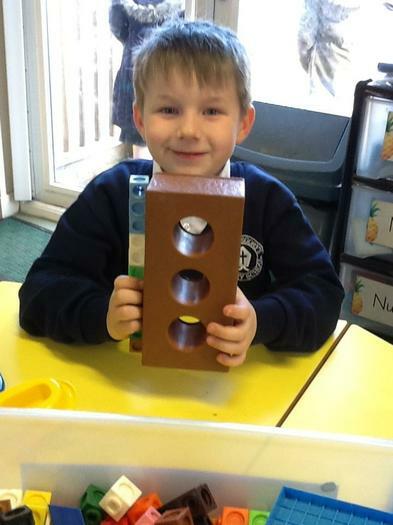 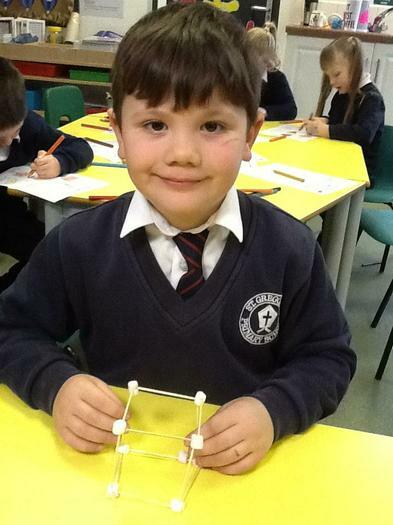 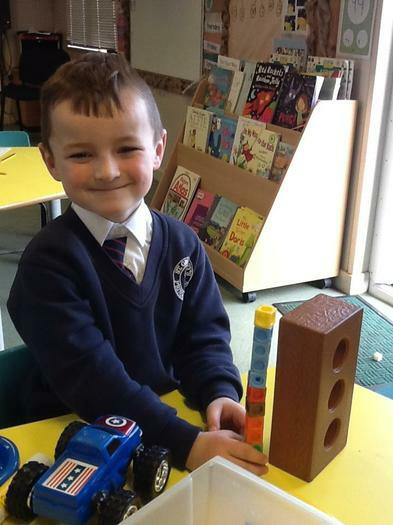 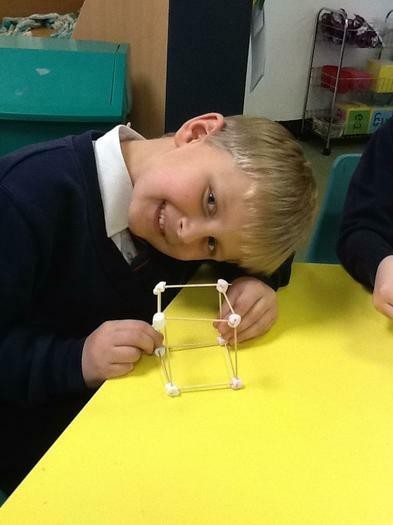 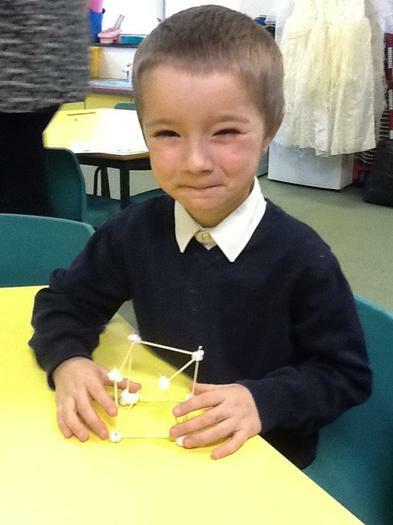 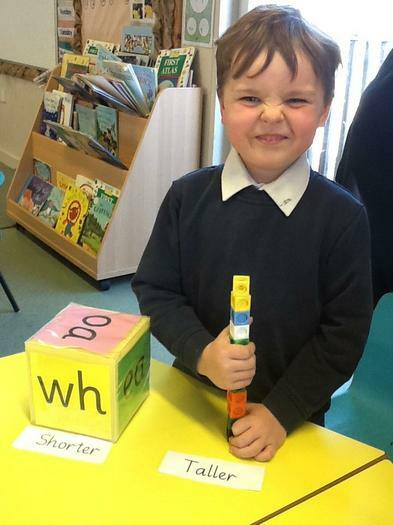 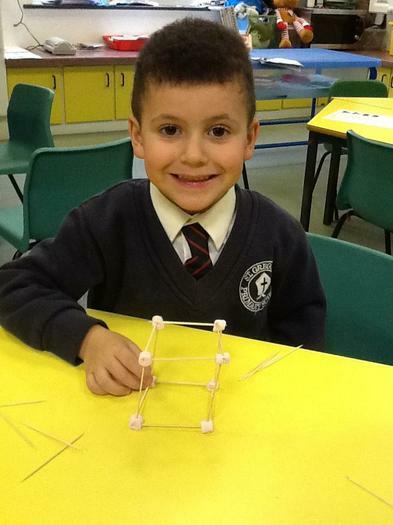 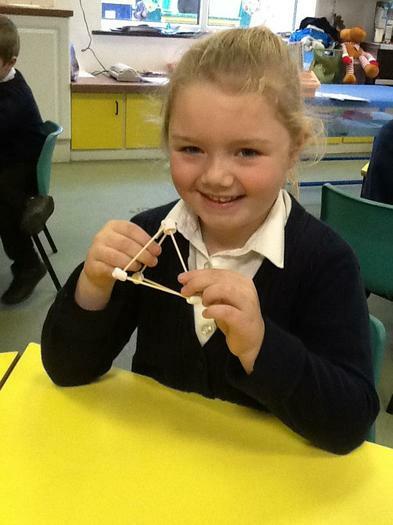 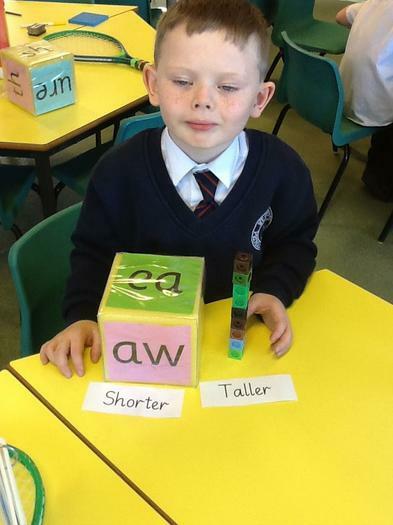 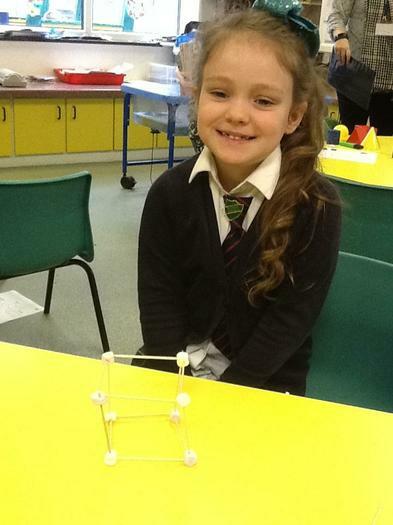 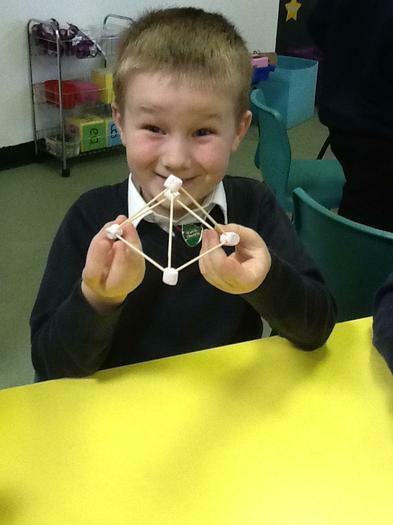 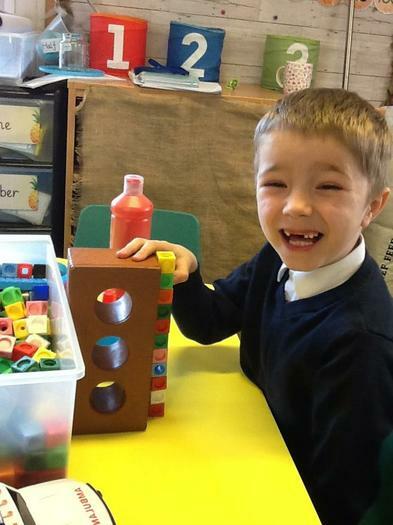 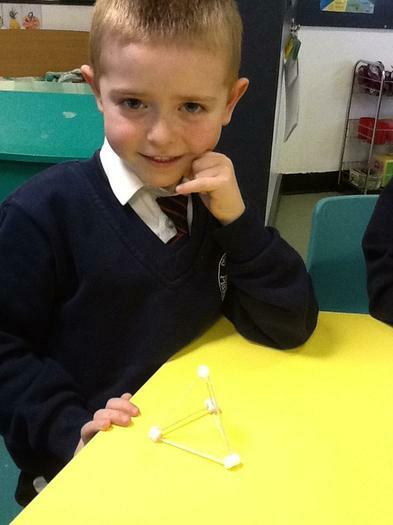 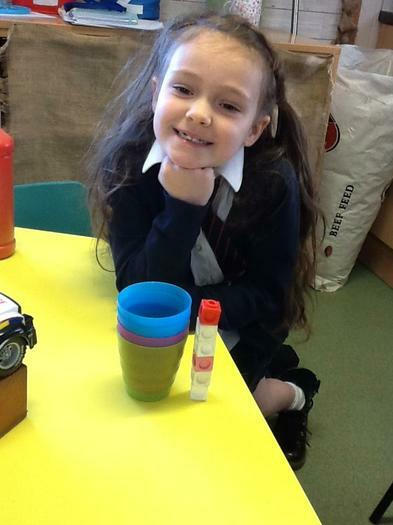 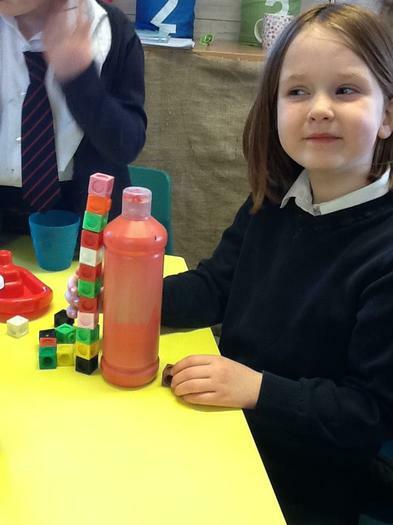 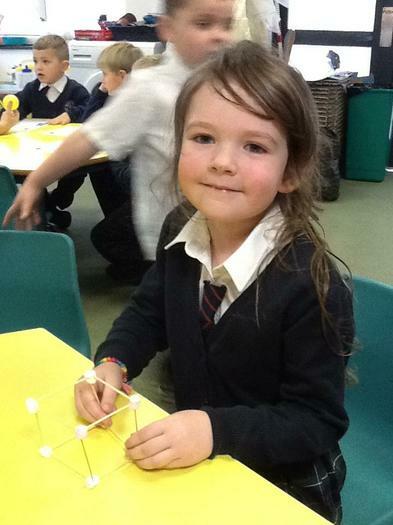 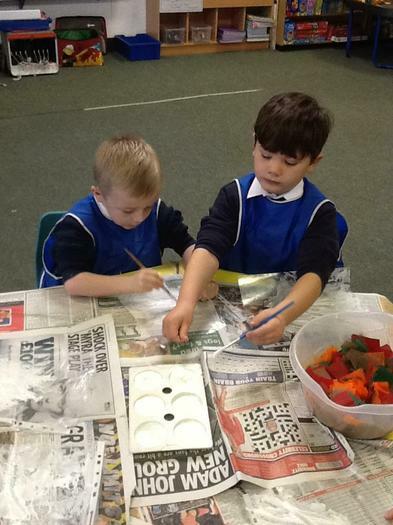 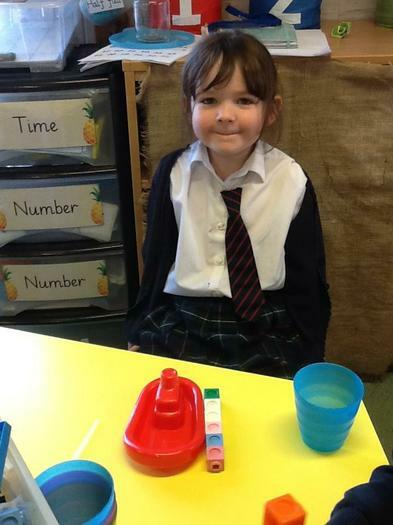 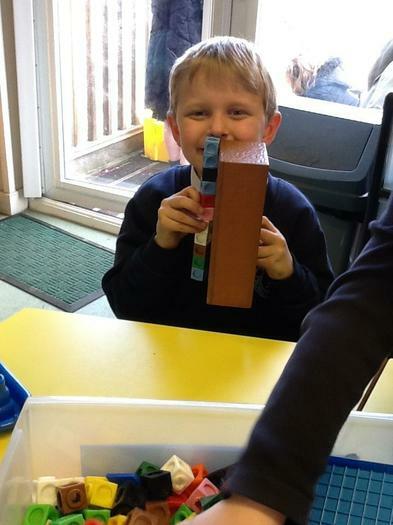 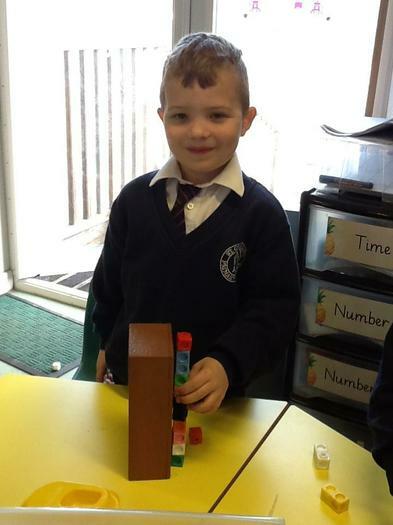 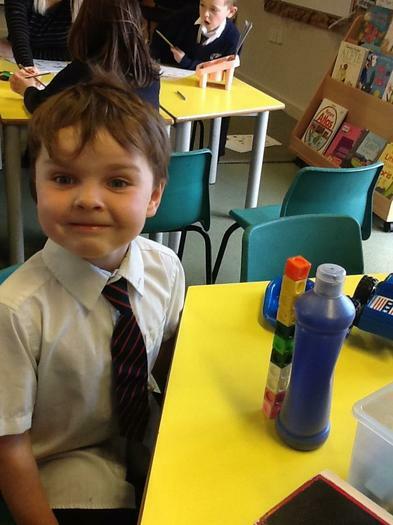 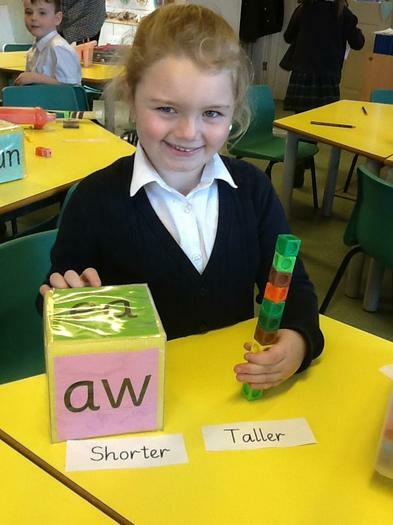 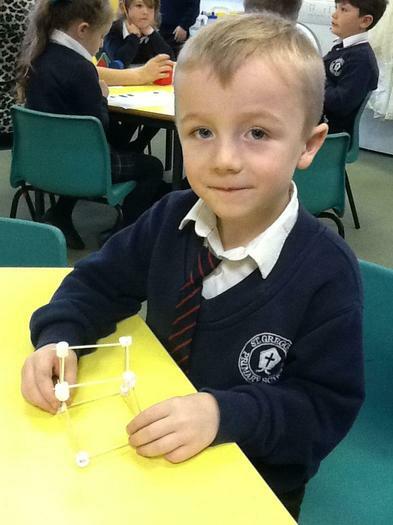 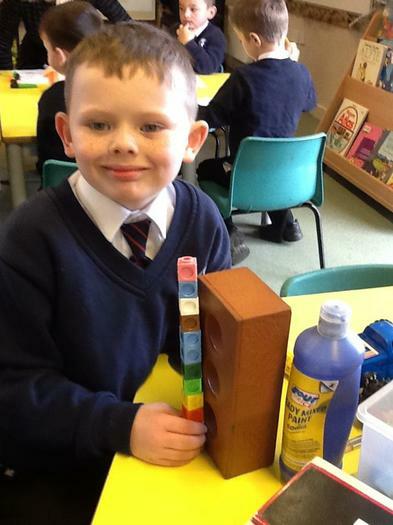 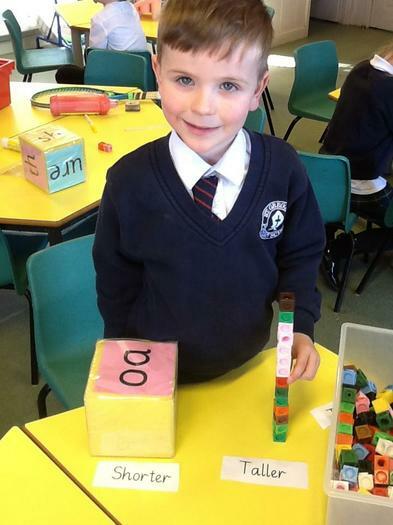 We have used cubes as a non-standard form of measurement to measure objects around the classroom. 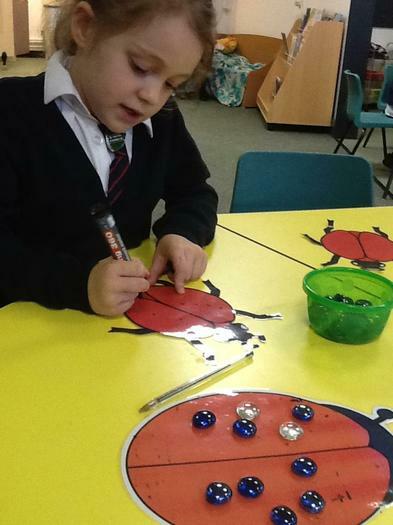 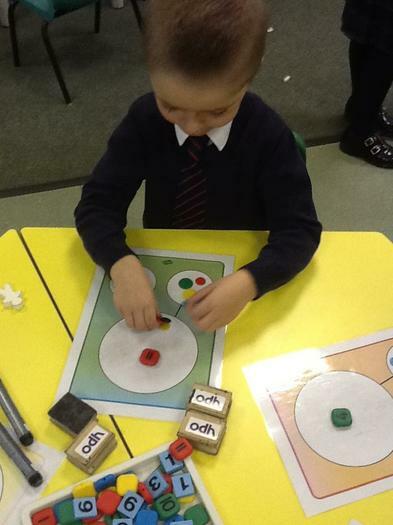 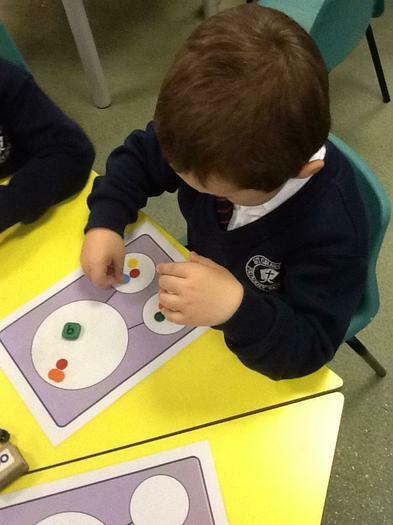 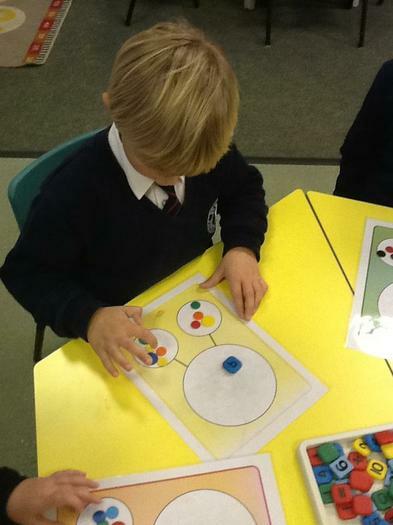 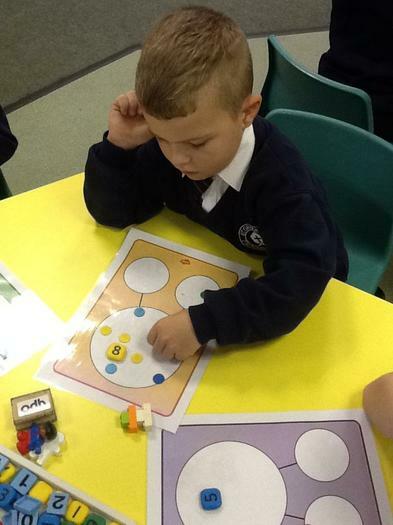 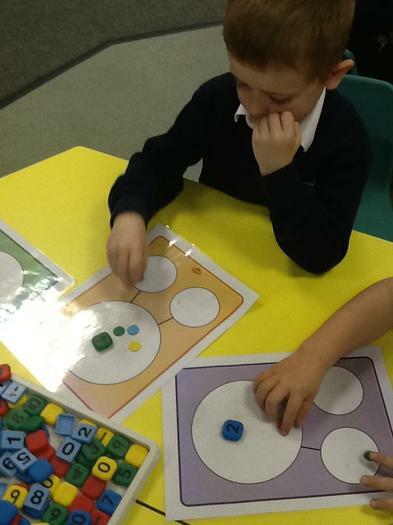 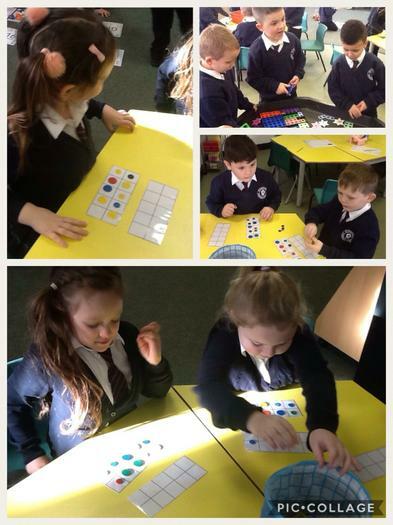 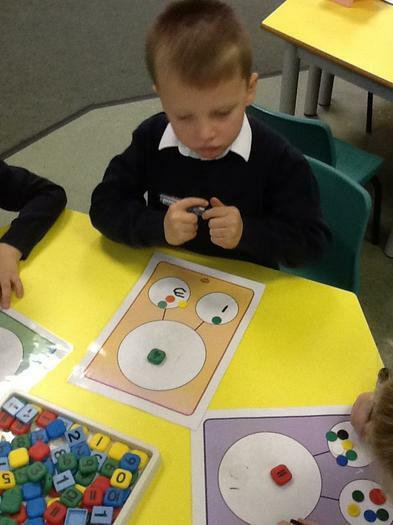 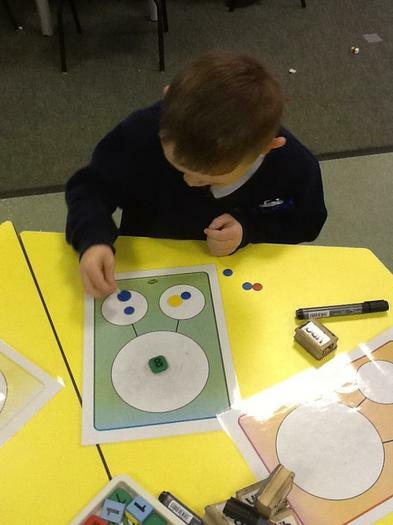 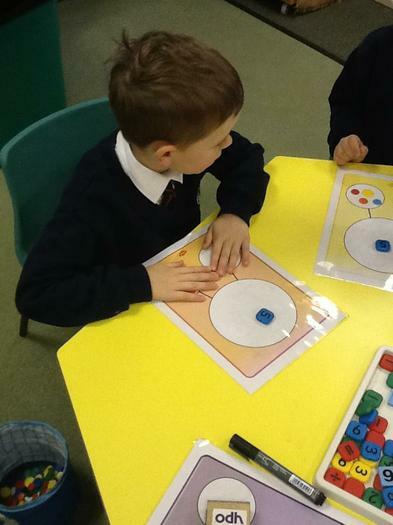 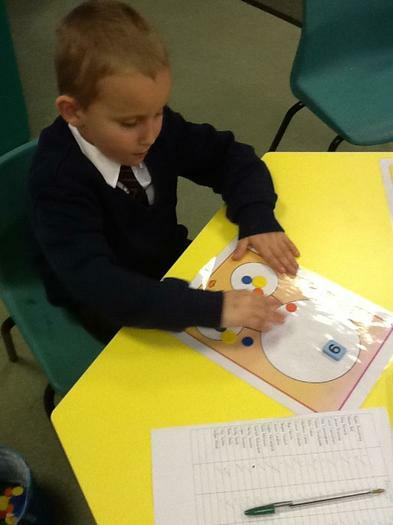 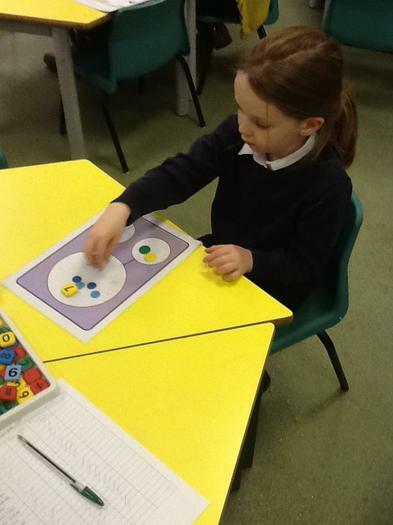 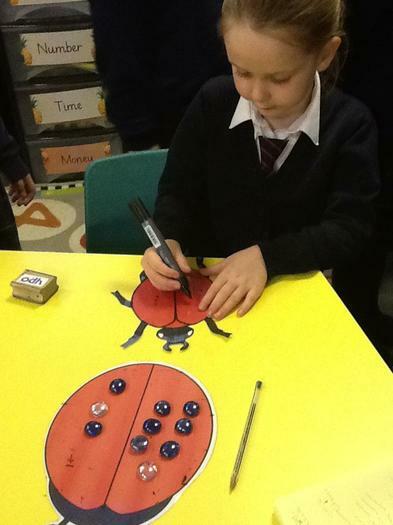 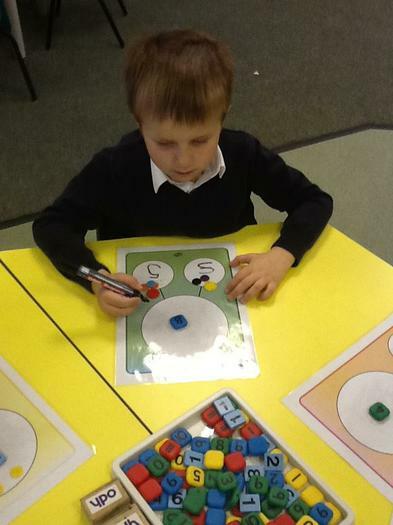 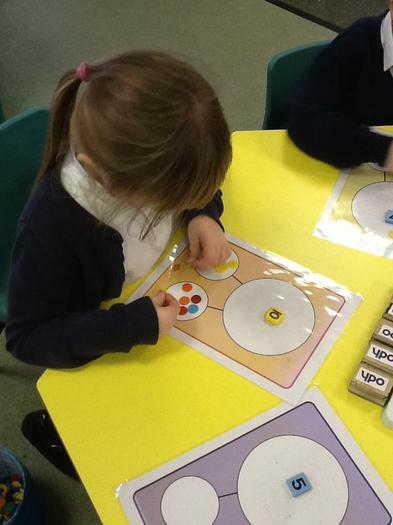 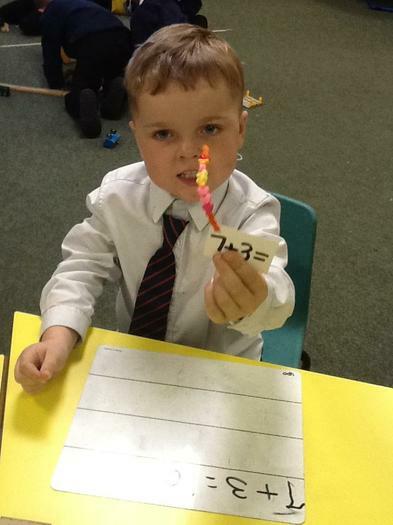 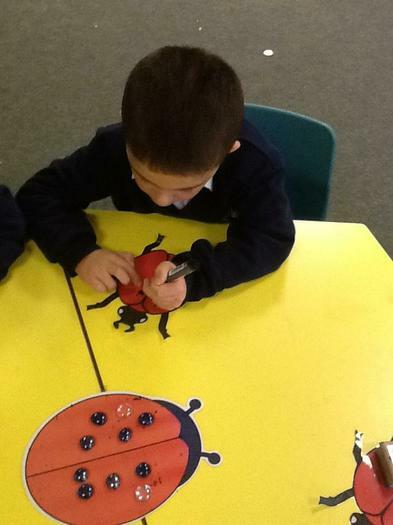 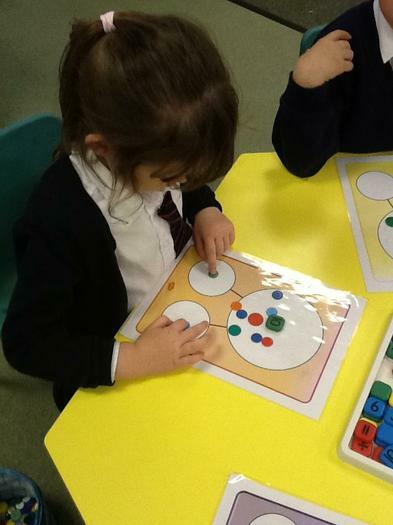 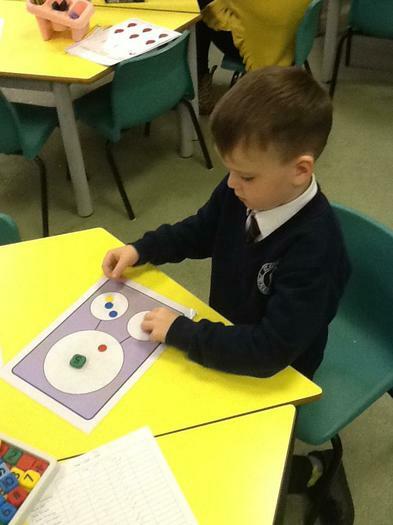 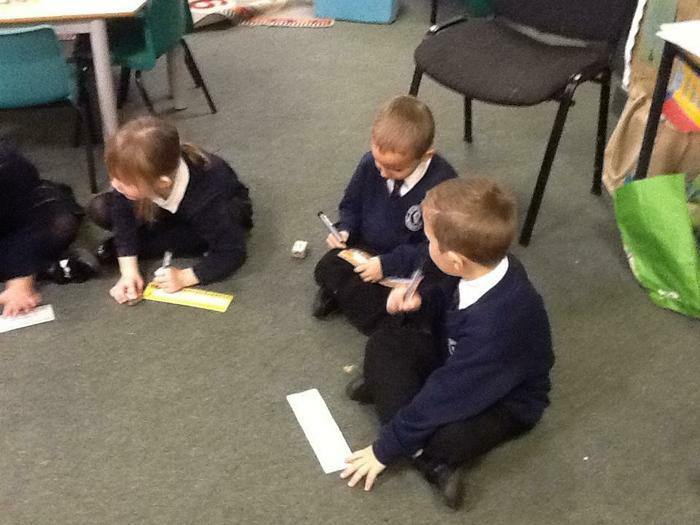 We have been practicing addition. 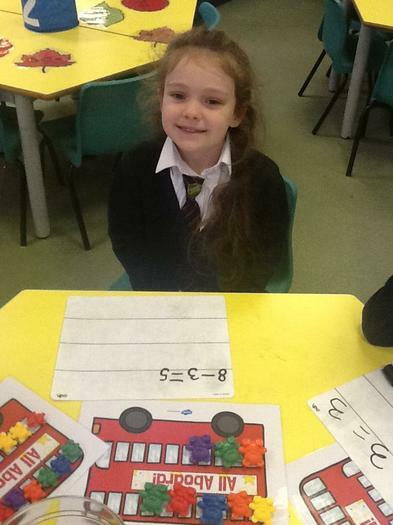 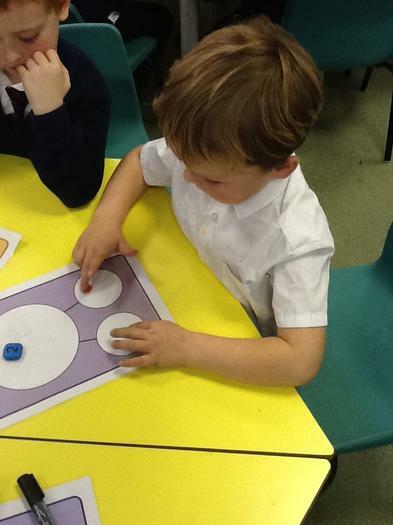 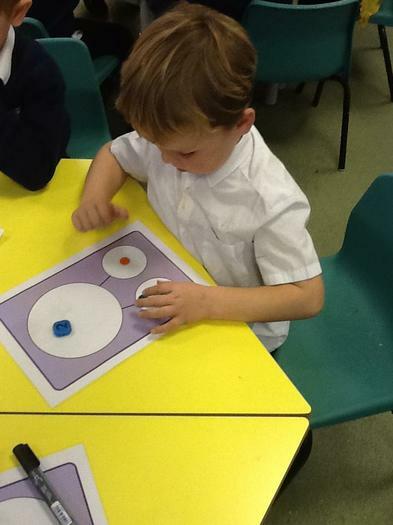 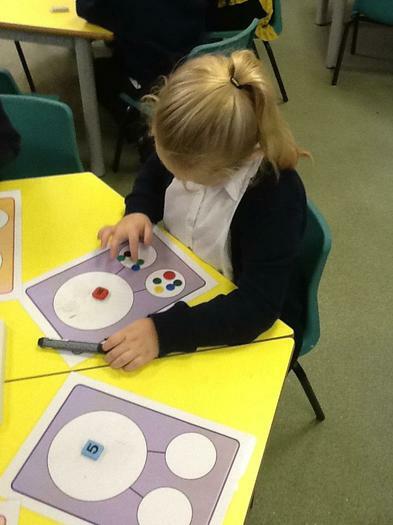 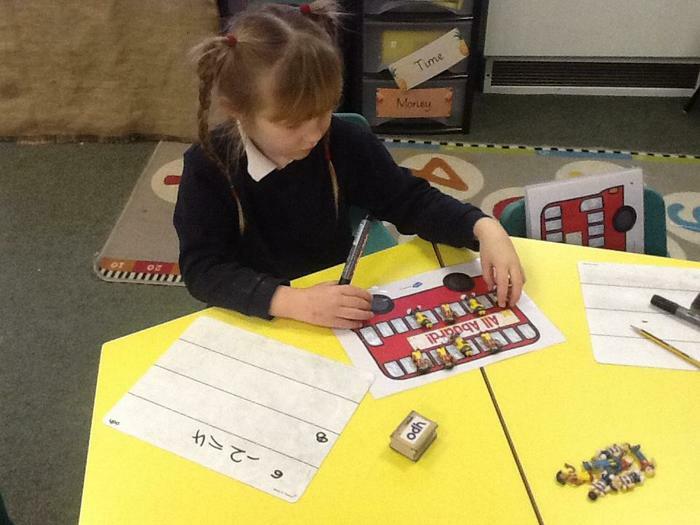 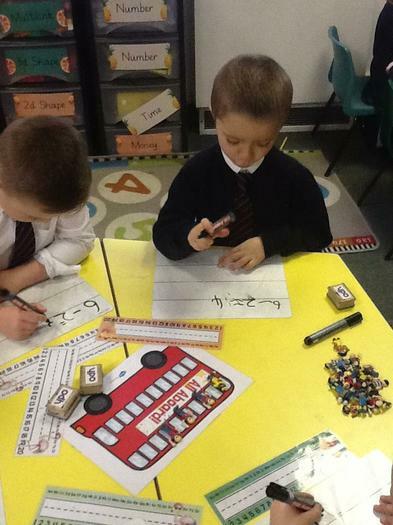 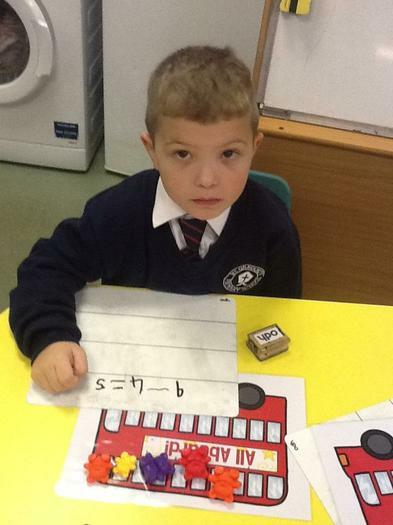 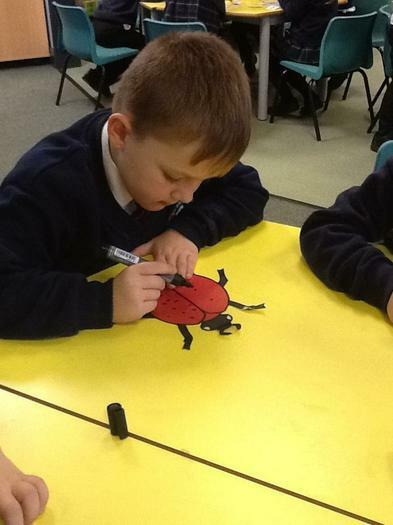 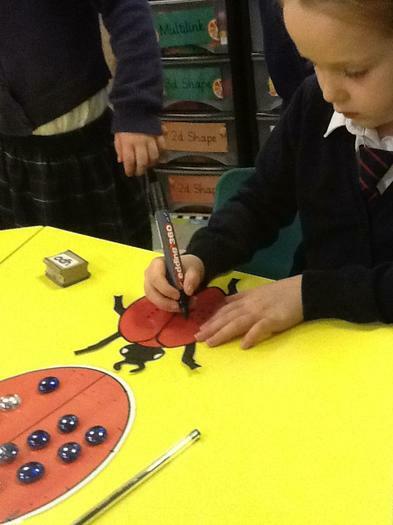 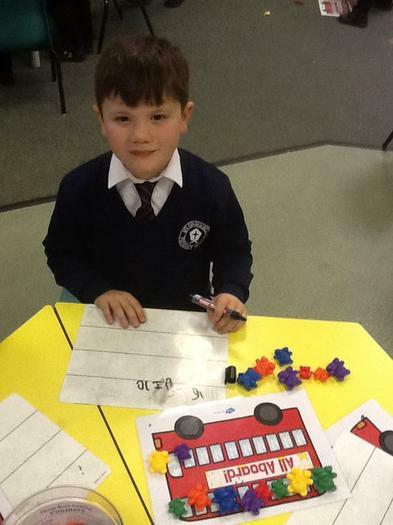 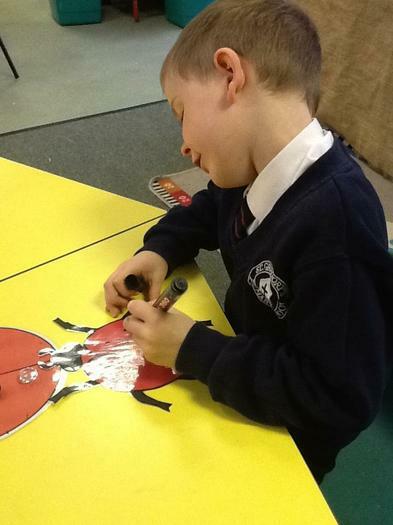 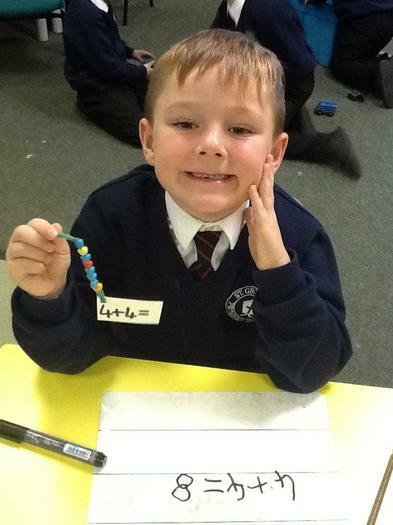 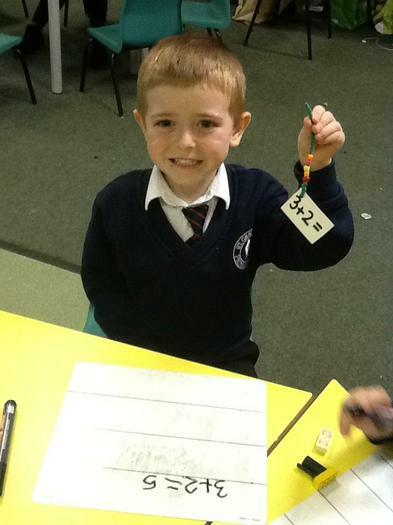 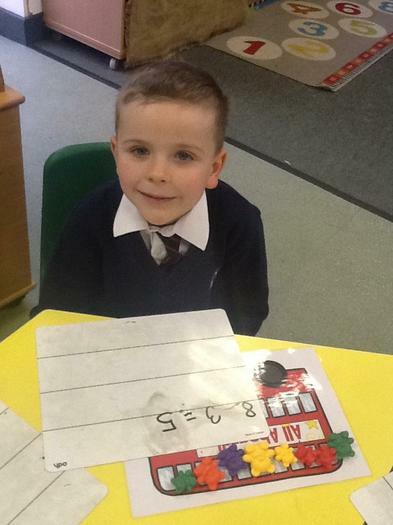 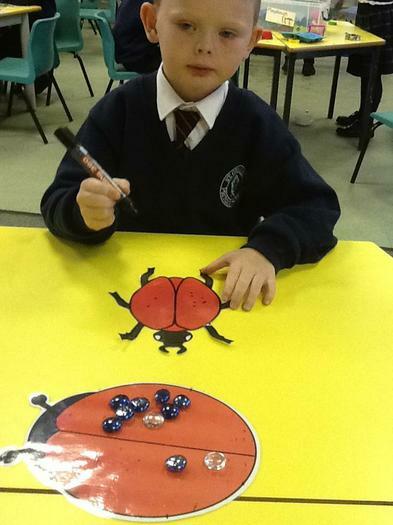 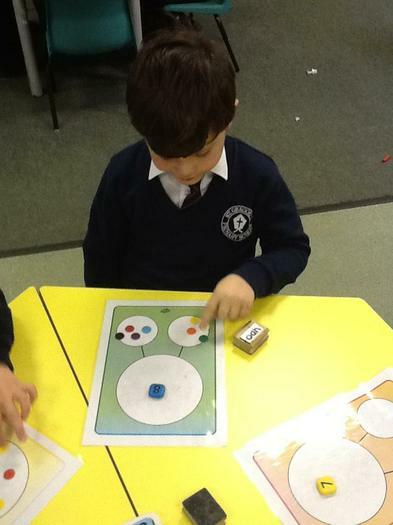 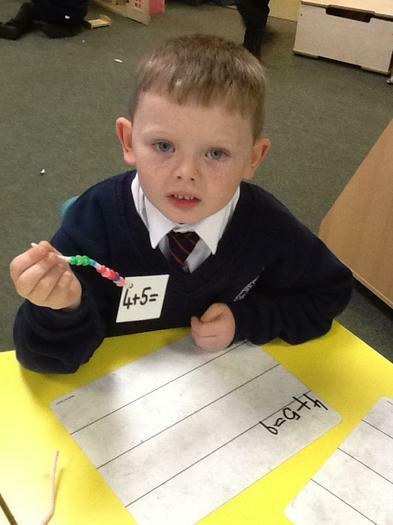 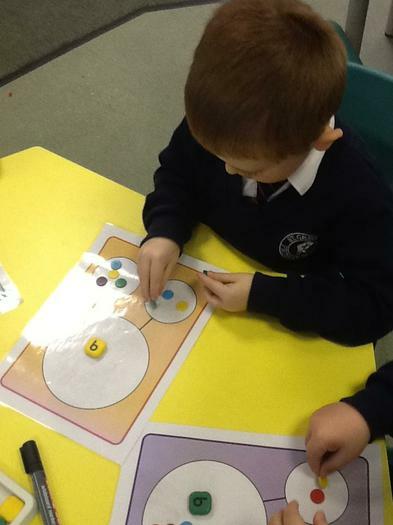 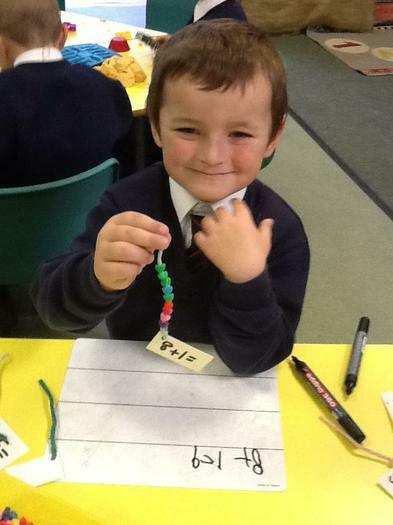 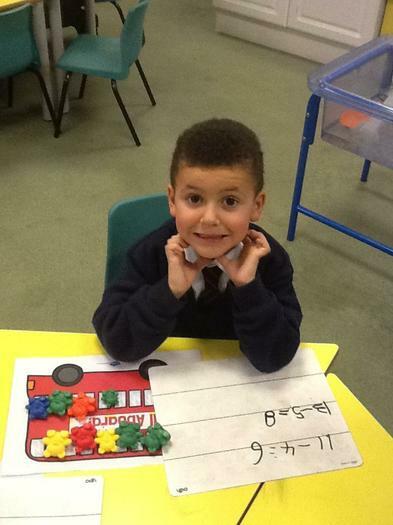 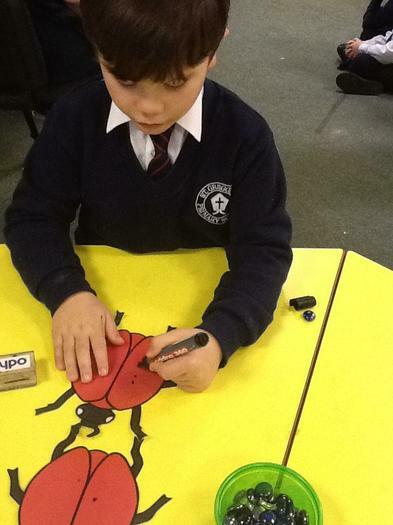 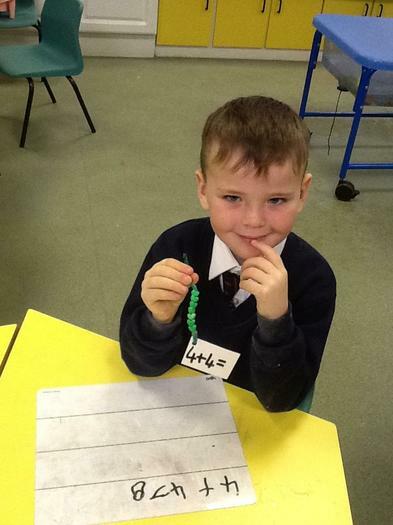 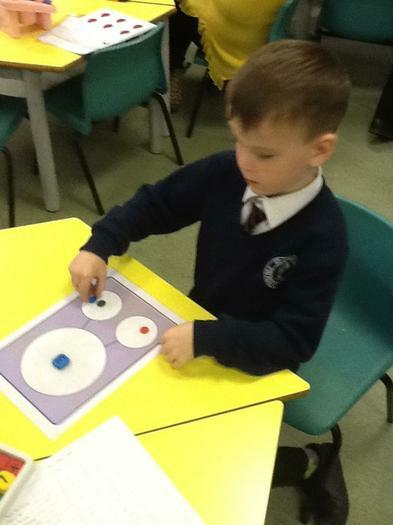 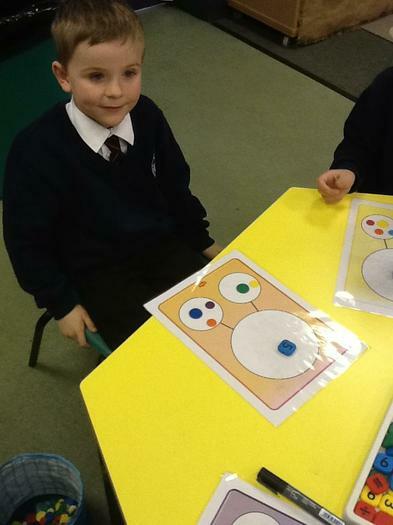 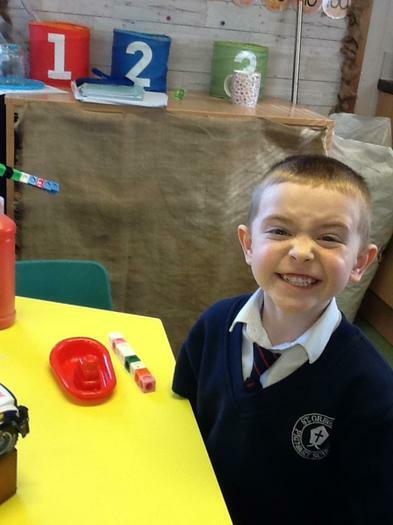 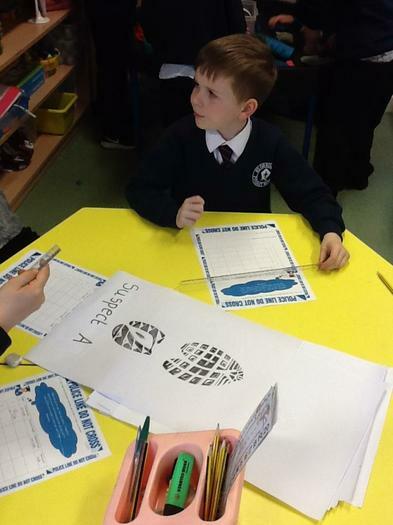 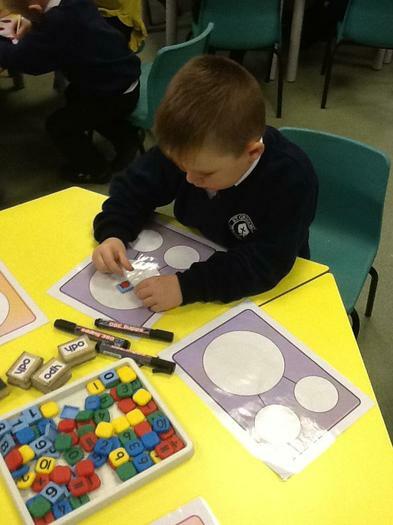 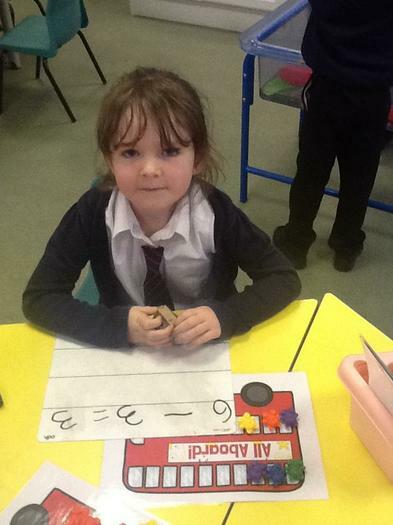 We have been learning about subtraction. 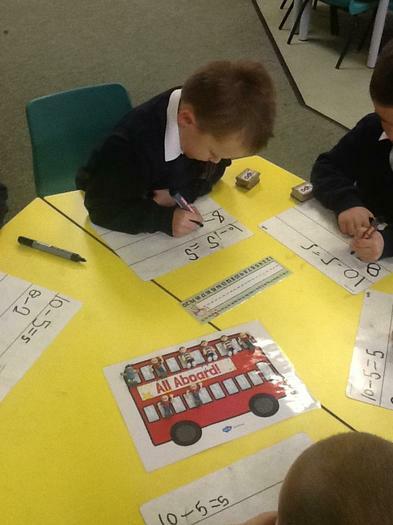 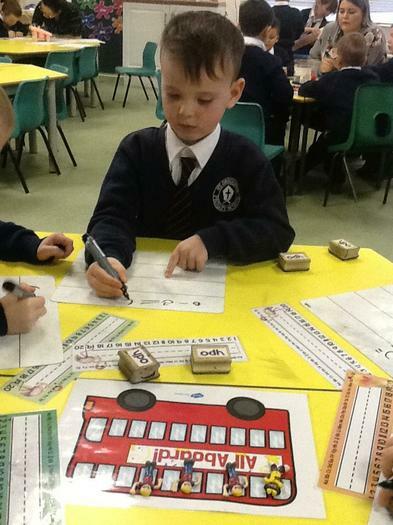 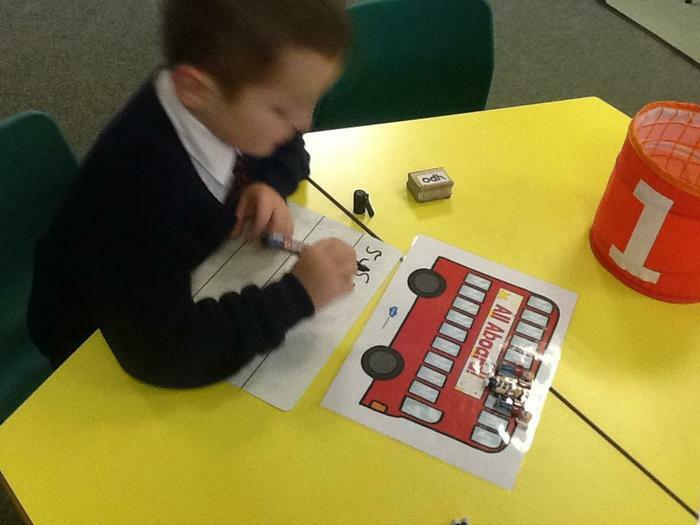 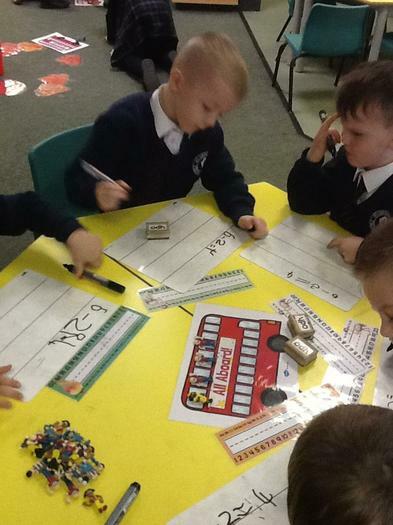 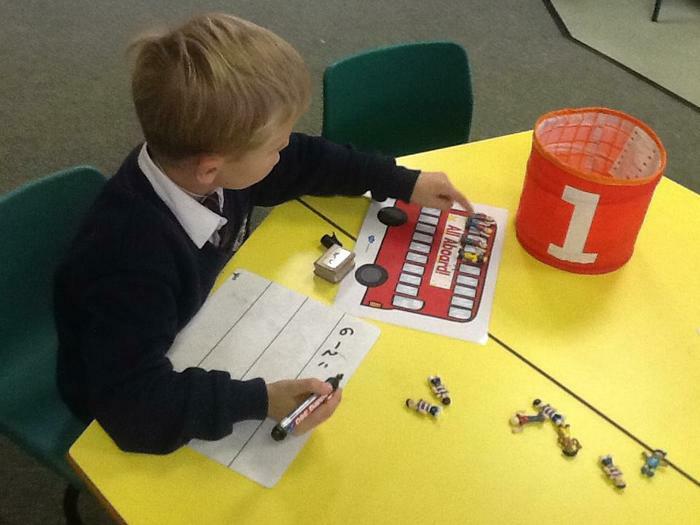 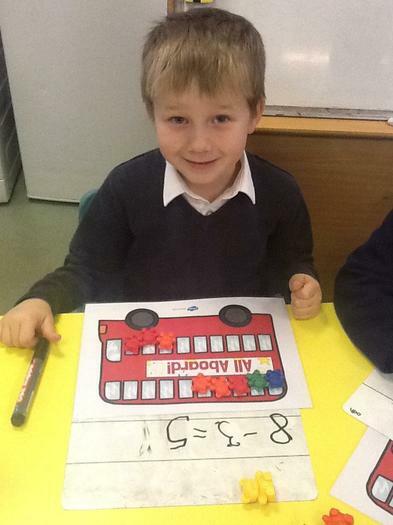 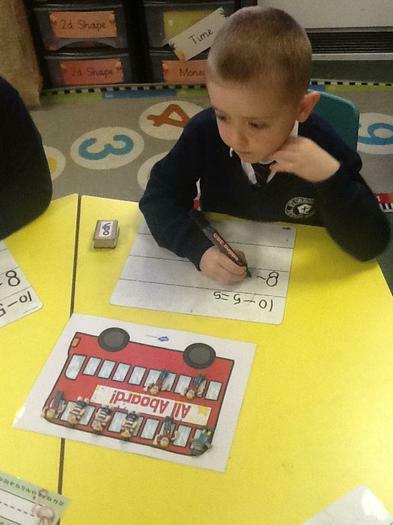 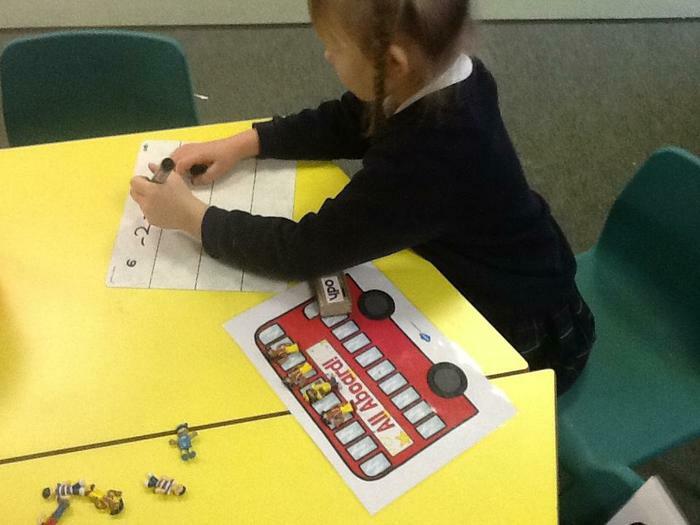 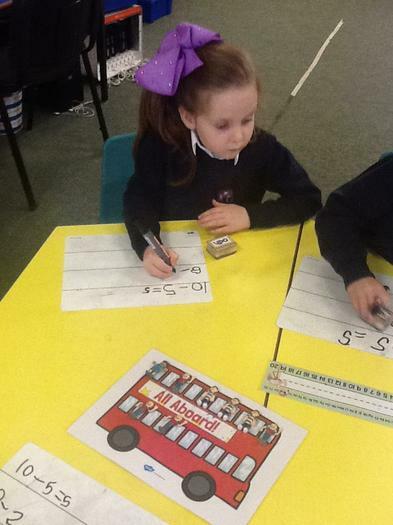 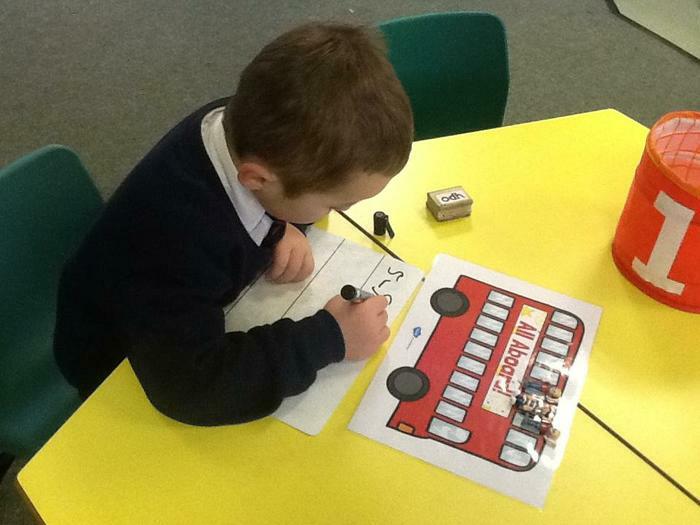 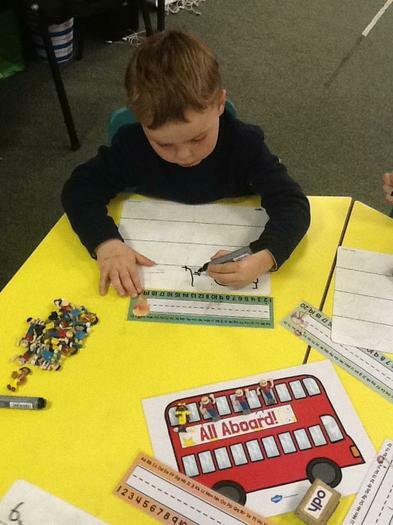 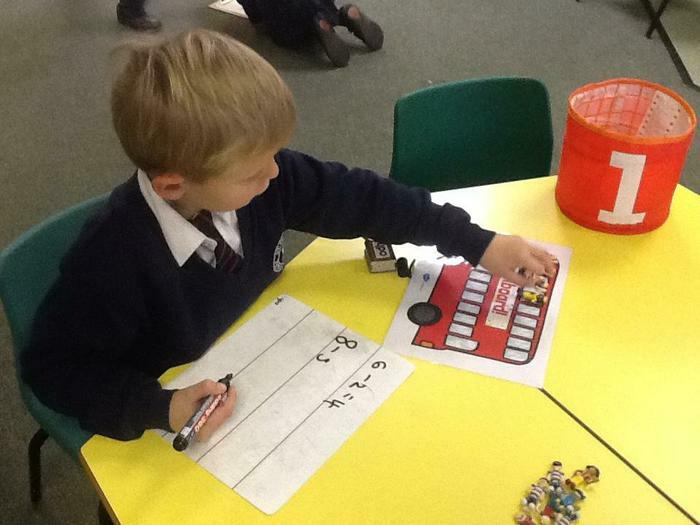 We took passengers off the bus to work out how many passengers we would have left. 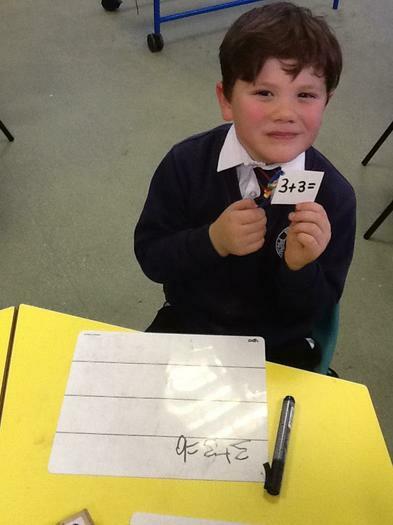 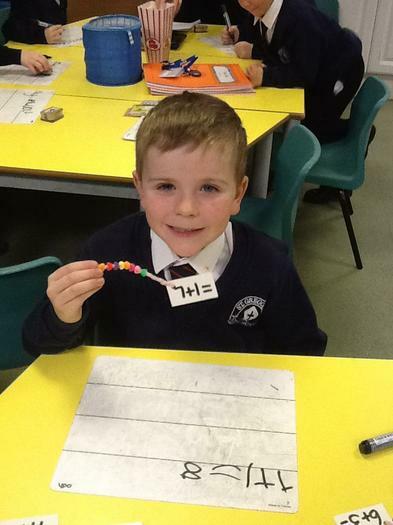 We then wrote this as a number sentence. 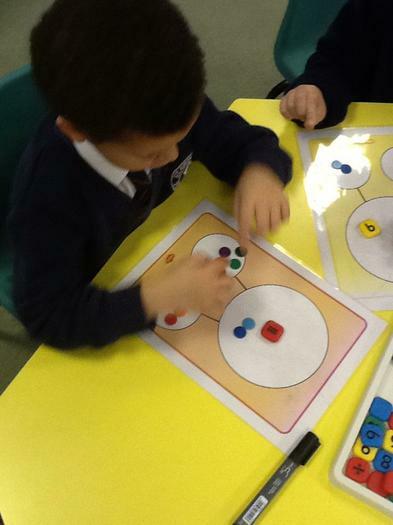 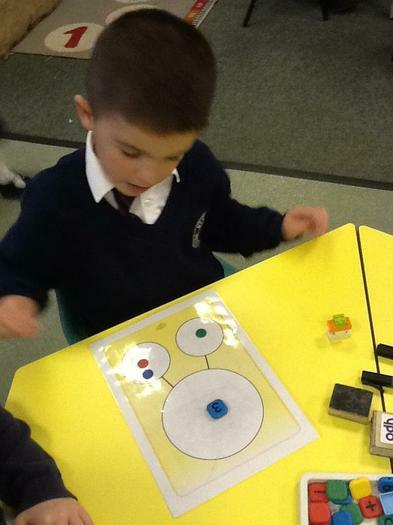 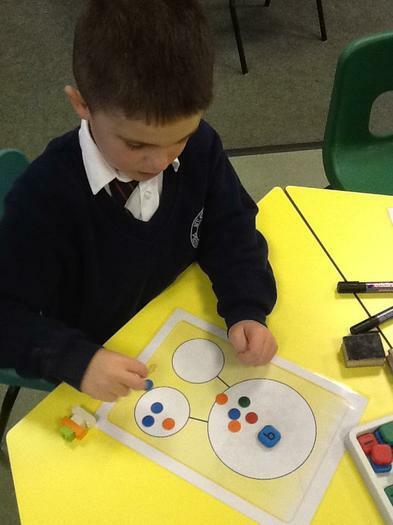 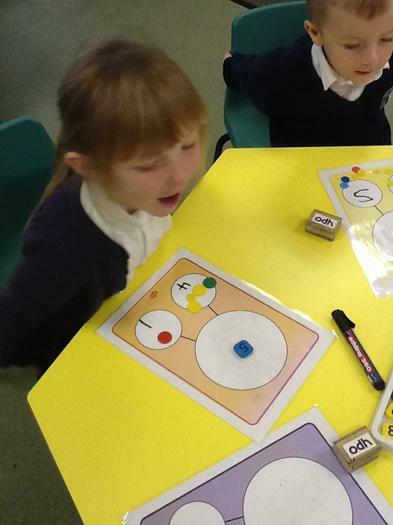 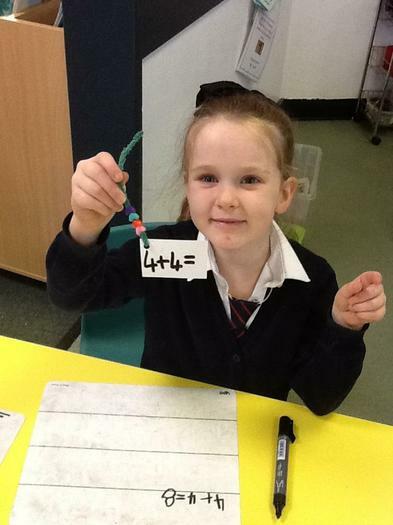 We have been partitioning numbers using a part whole model. 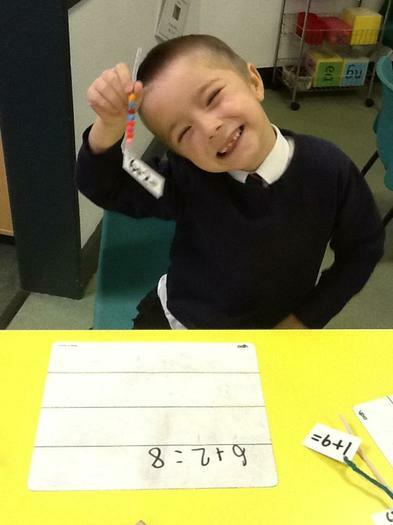 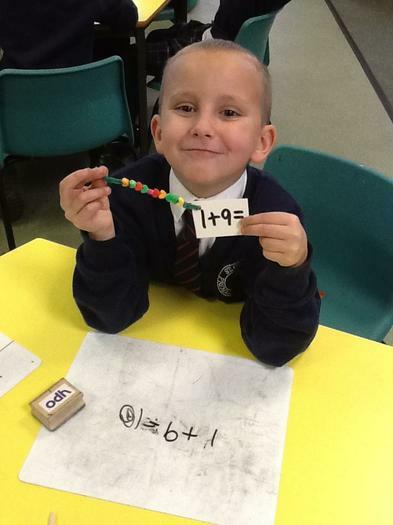 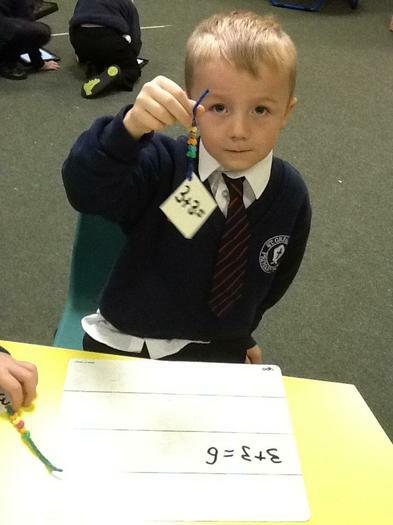 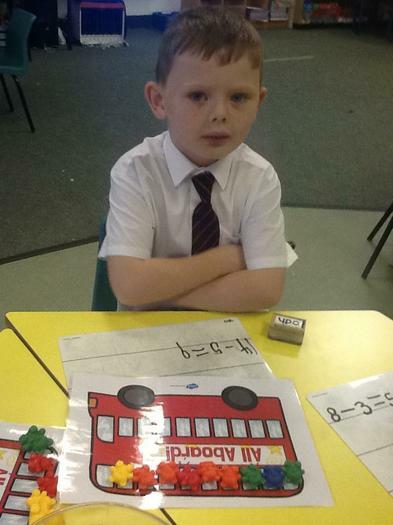 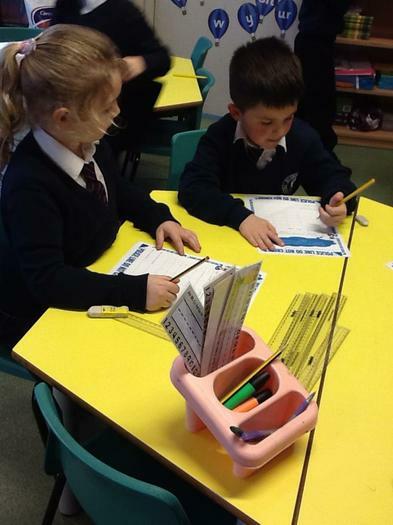 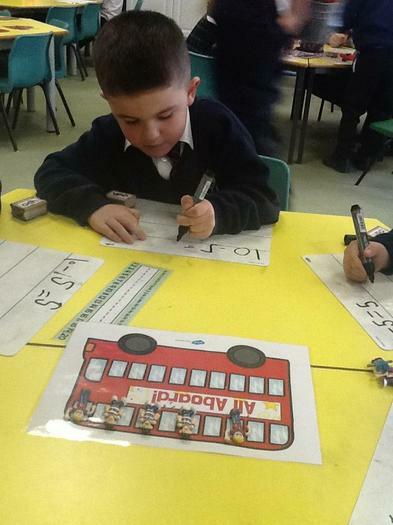 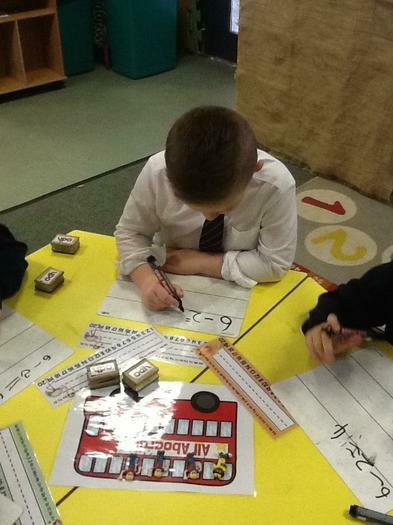 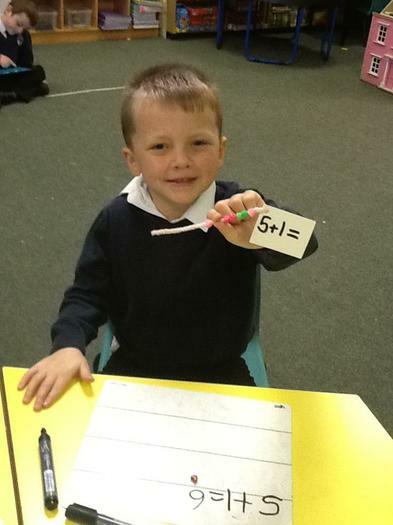 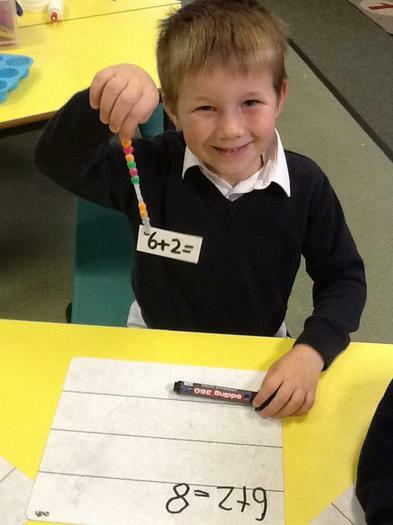 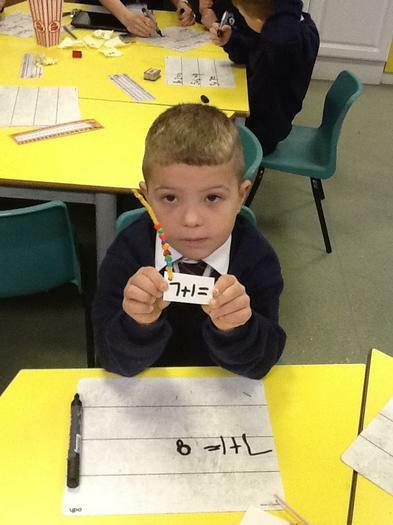 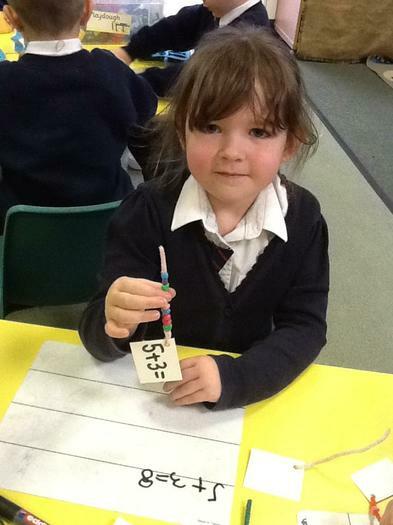 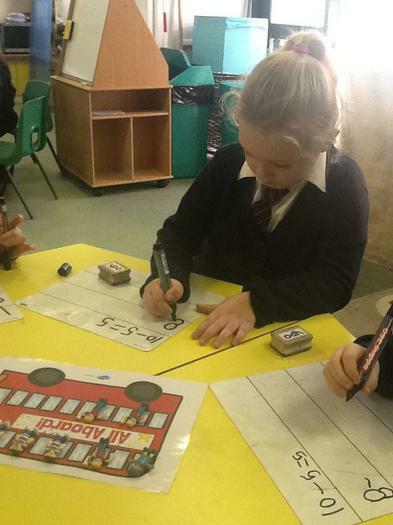 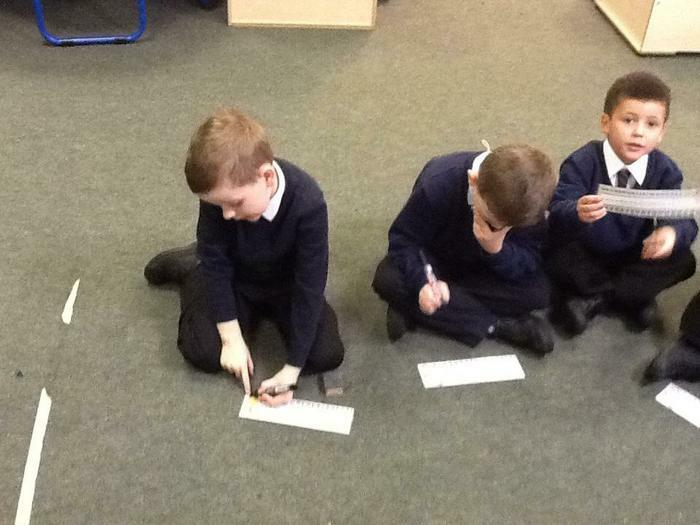 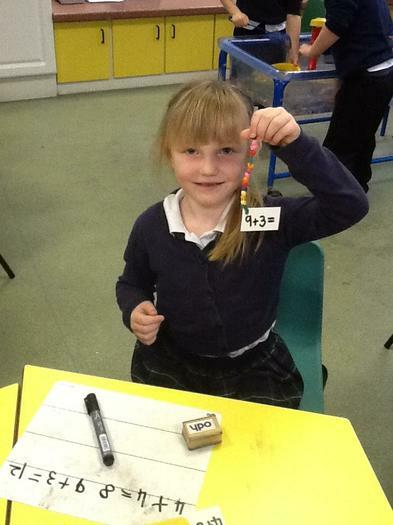 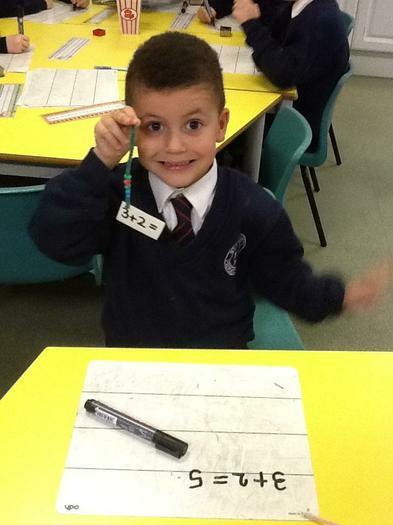 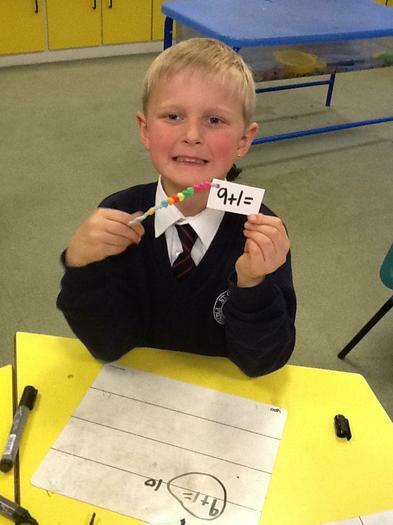 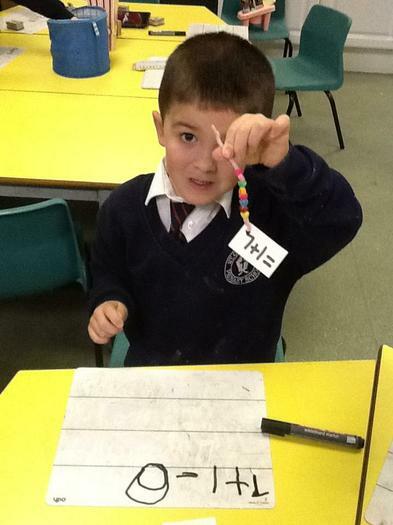 We have been learning to subtract numbers using a number line. 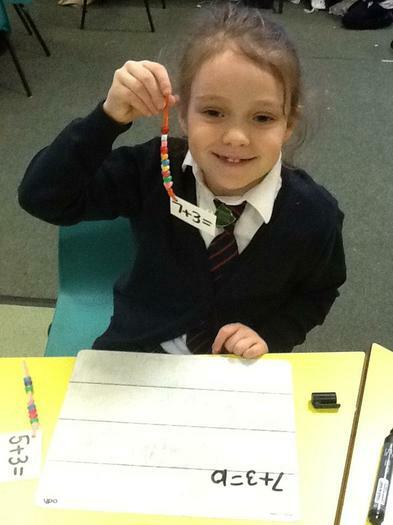 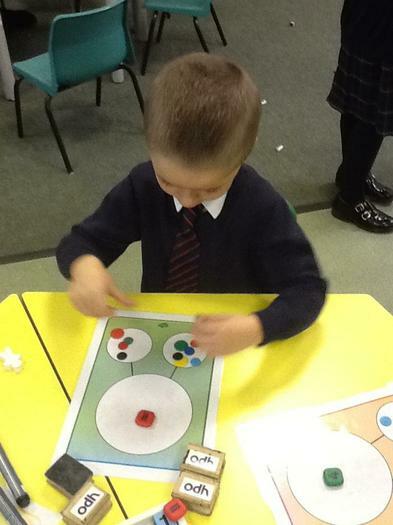 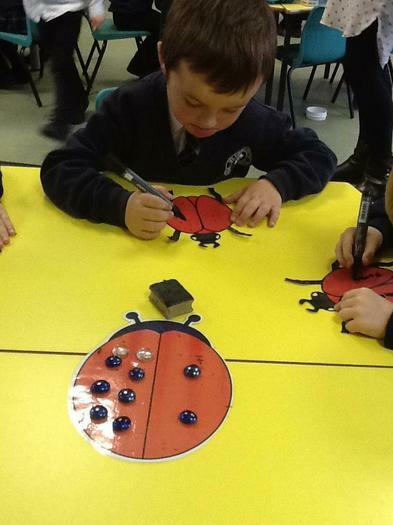 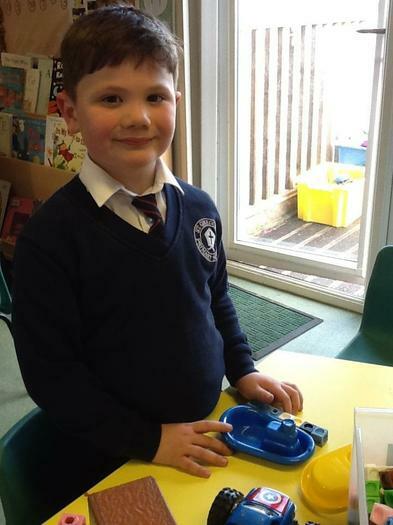 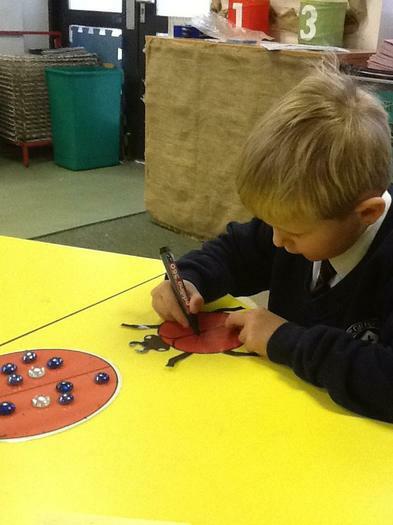 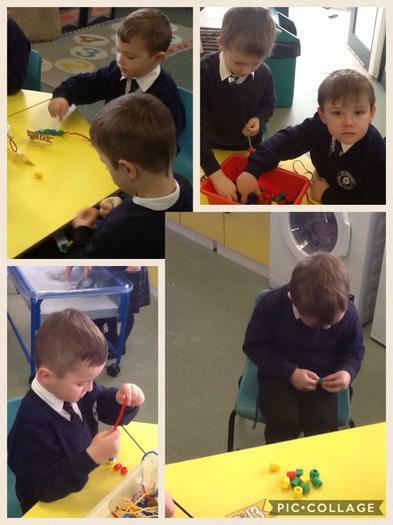 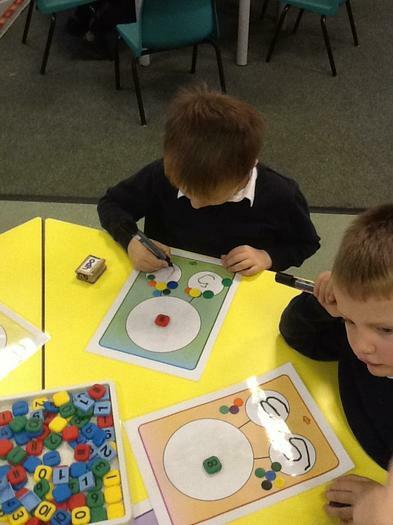 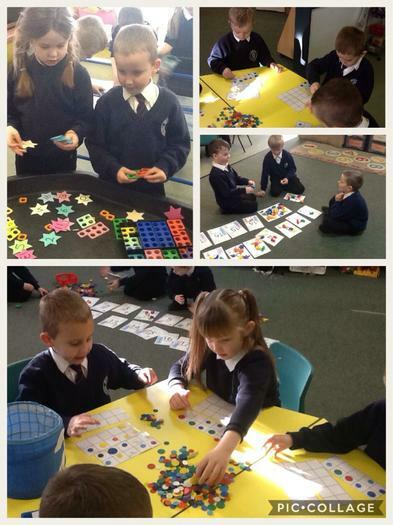 We have been representing numbers to 50 using objects.